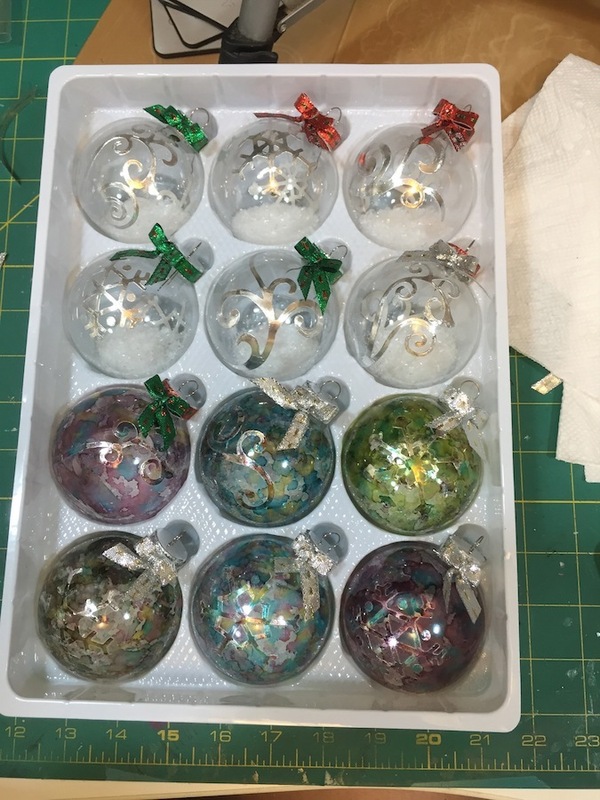 Today is the day the video is up on my YouTube channel showing the process of altering these glass ornaments. 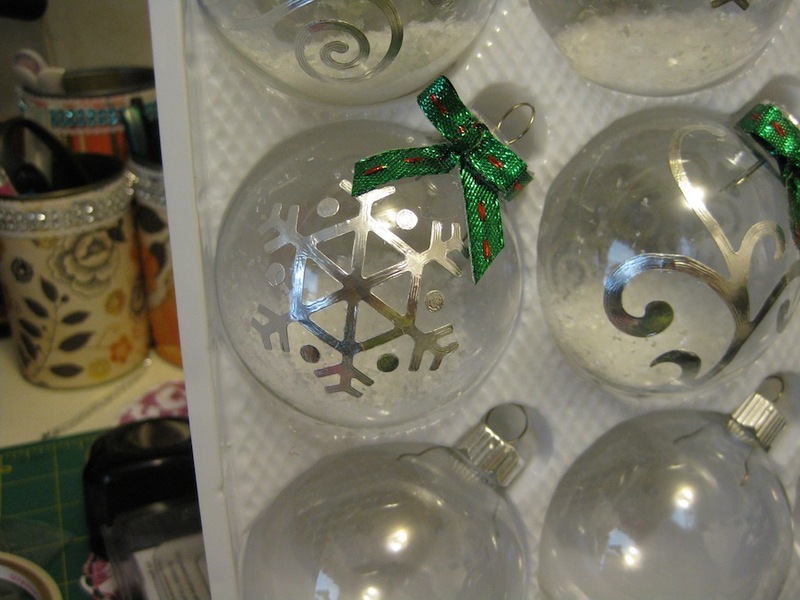 I used a couple of Sizzix dies – Flourishes and Snowflakes – with my metal duct tape from the hardware store. The first six I left clear. The bottom six I used Ranger Industries Alcohol Inks in the colors of Current, Stream, and Butterscotch. The first three are Current on the left, Stream in the center, and Butterscotch on the right. 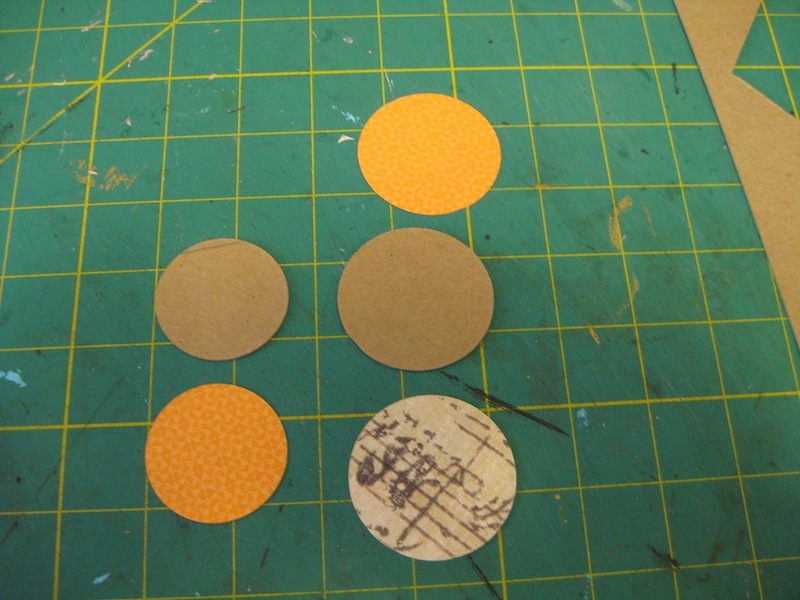 The bottom left one is a remix of the colors on the same felt pad and it turned a little brown. I like that one. 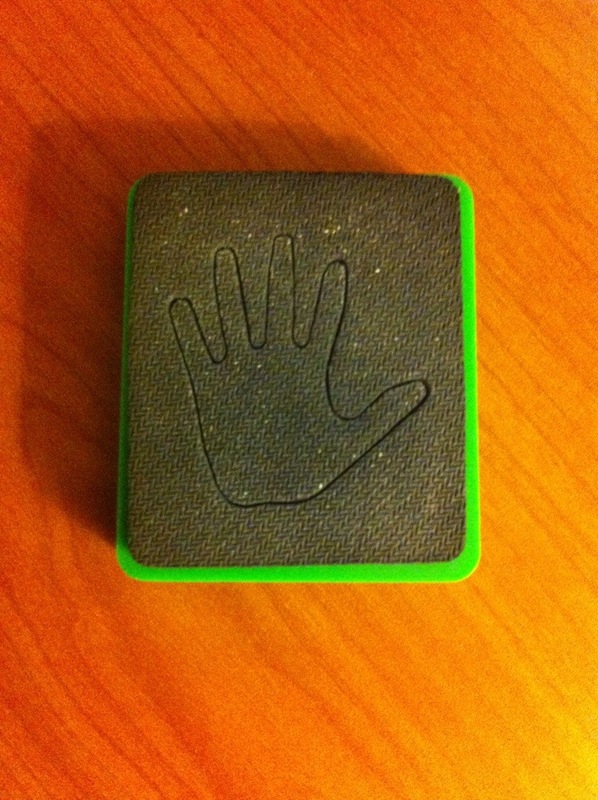 For the final two I used a new felt pad to finish them off. This flourish was a real bugger to work with. So many intricate swirls and curves. This one was way too fiddly for me. 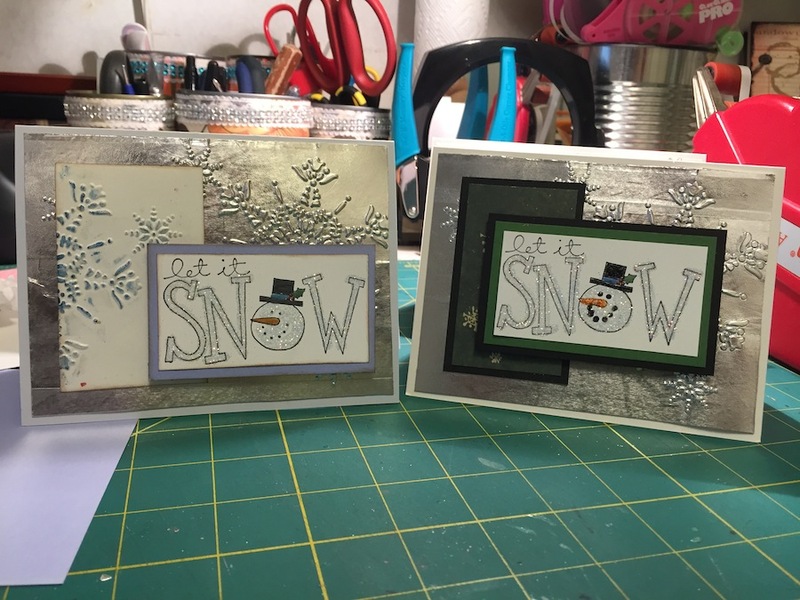 By the time I adhered the second one of this flourish die cut from the metal duct tape….I was so over this whole entire project. I had to get encouragement from my daughter with the twins to keep going and see it through to the end. 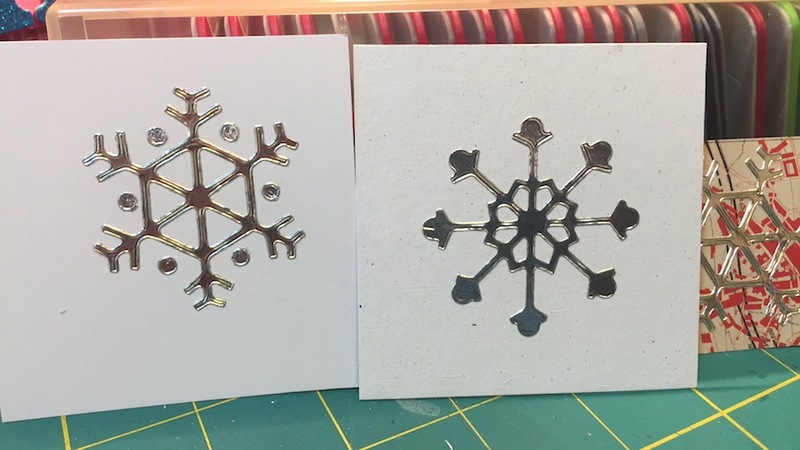 The Snowflake dies were the easiest to cut out, take apart, and adhere. 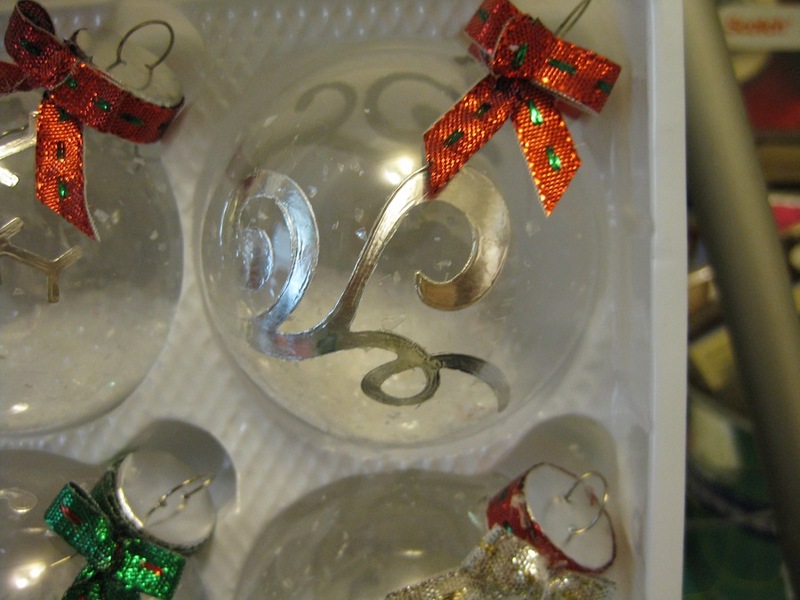 I did have a few problems with them but nothing like the really intricate flourish. 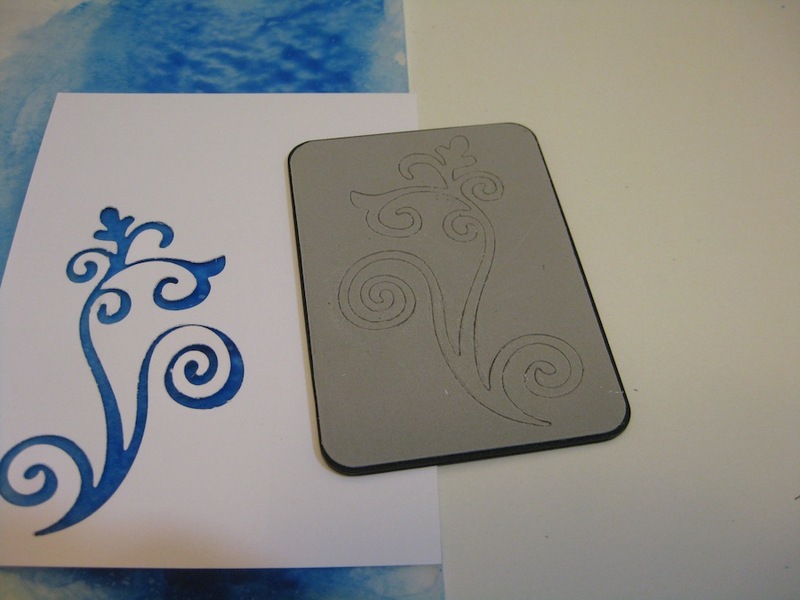 The less intricate flourish dies were really great to work with. This project took me over two days to complete. I have the attention span of a gnat and a shorter patience span than that. 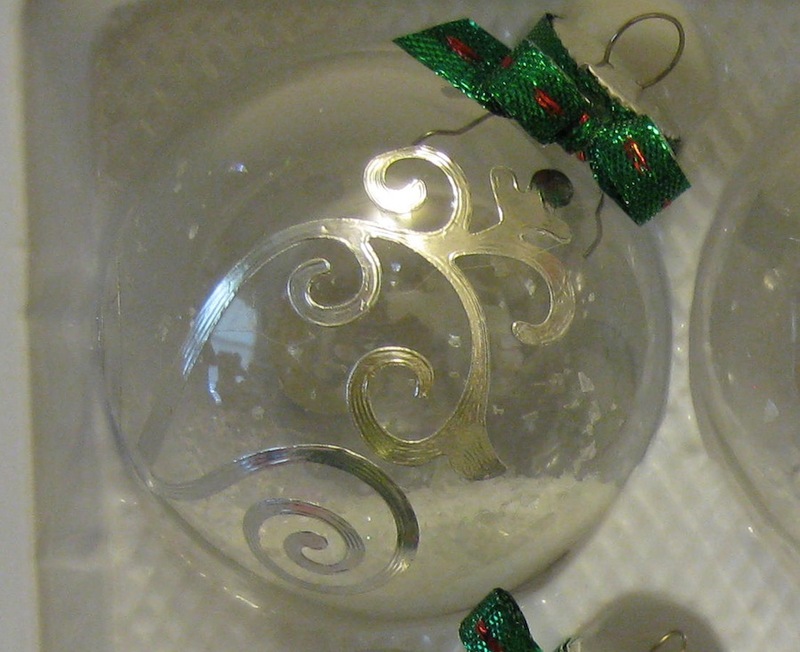 Altering Christmas clear glass balls will NOT be on my list of must do decorating again. 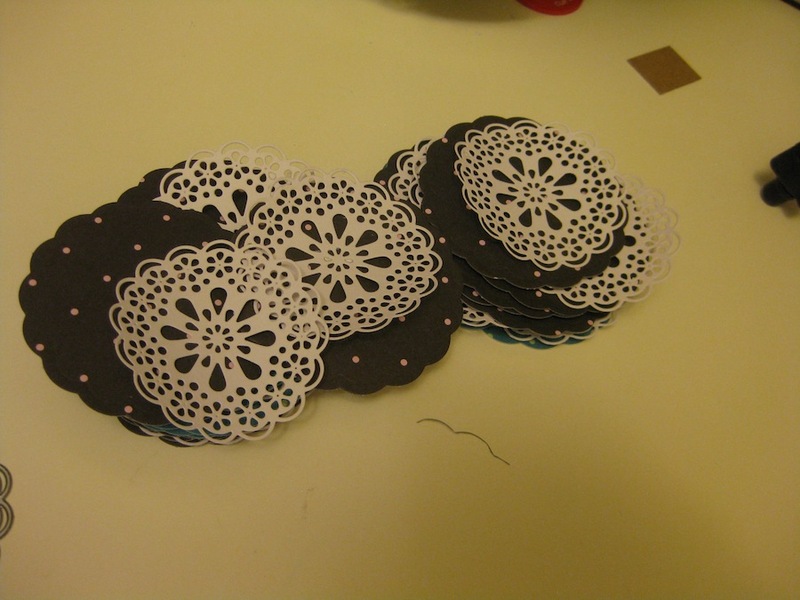 My daughter with the twins suggested that I make a whole bunch of these and sell them at a craft fair. My answer to her was “Not just NO, but H*&L NO!” I’ll leave that job to someone that enjoys fiddly things. The other nuisance was having to use the hot glue gun for the ribbon around the neck and the fork bow on each of the balls. I do get to have the pride and privilege of saying “I made these” and there will never be anymore like them. Someone else may take a stab at creating these for themselves but they won’t be the same as mine are. Card making supplies at your local hardware store. 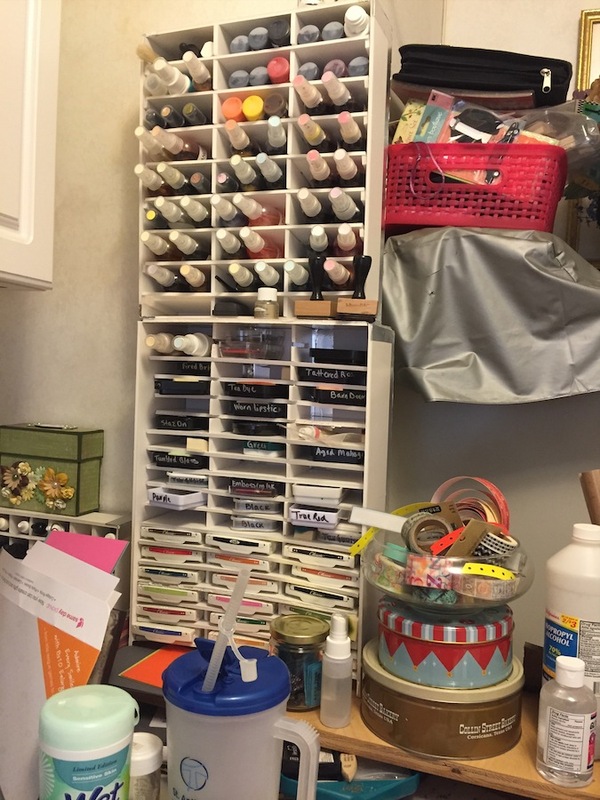 In the storage cabinet above my work table is a plethora of adhesives I use. One of those adhesives is a roll of metal duct tape I’ve had for a number of years. 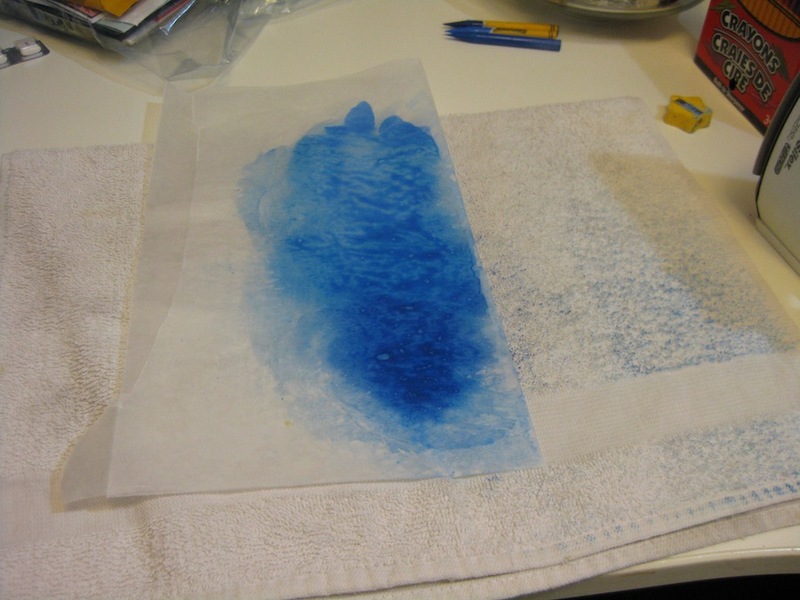 I used it to make my ink pad, ink refill, and shimmery spritz storage units several years back. The metal duct tape comes on a roll about two inches wide and I don’t even know how many yards. 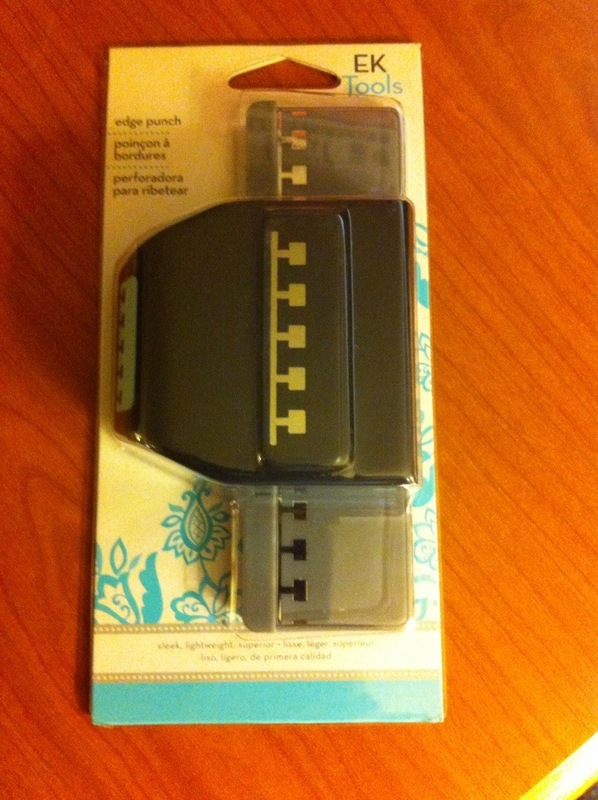 I have used this tape with embossing folders but not with my dies. I thought I would do some experimenting. In my scrap stash I have a lot of three inch square pieces of paper. So if I screwed up there would be no hardship on me. 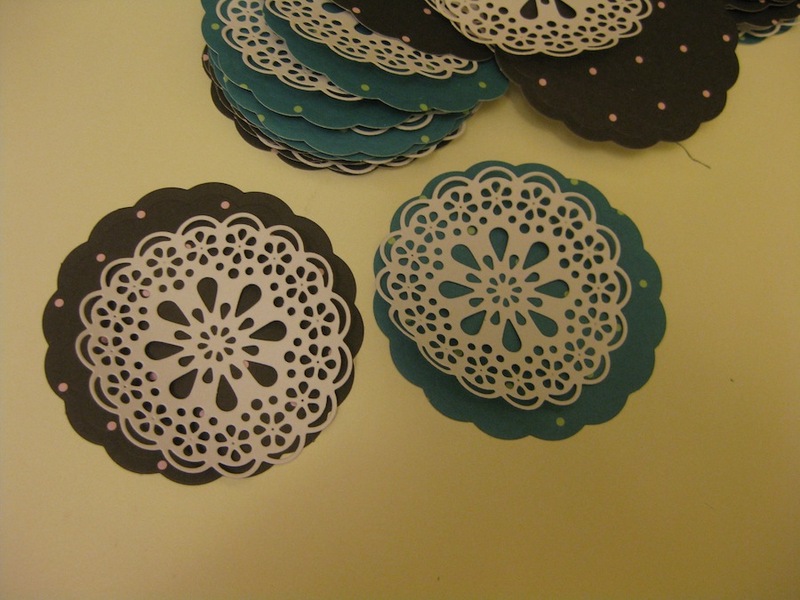 The die cut snowflakes disappeared in the patterned paper. I wondered what they would look like on white paper. 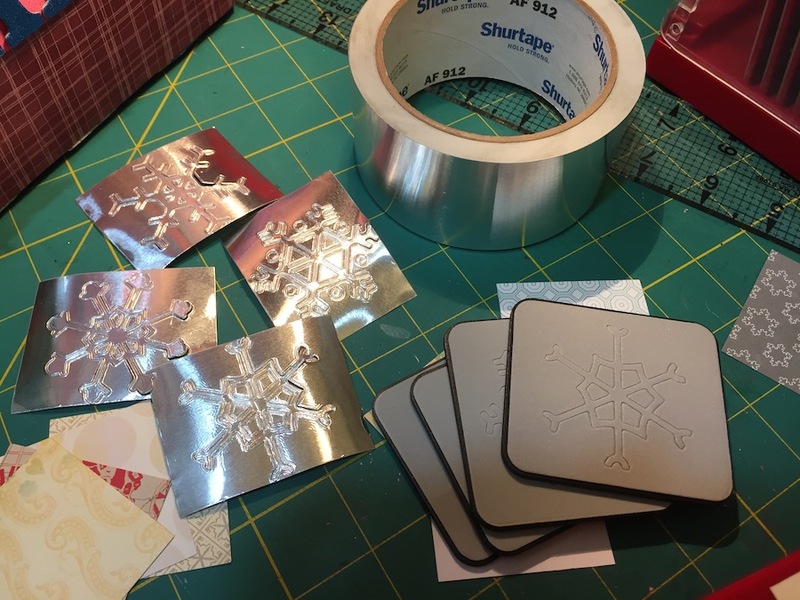 Finding success in using dies with the metal tape I took it one step further and smoothed the tape over a piece of card stock to be used on a card front and ran it through my Big Shot with a snowflake embossing folder from Stampin’ Up! 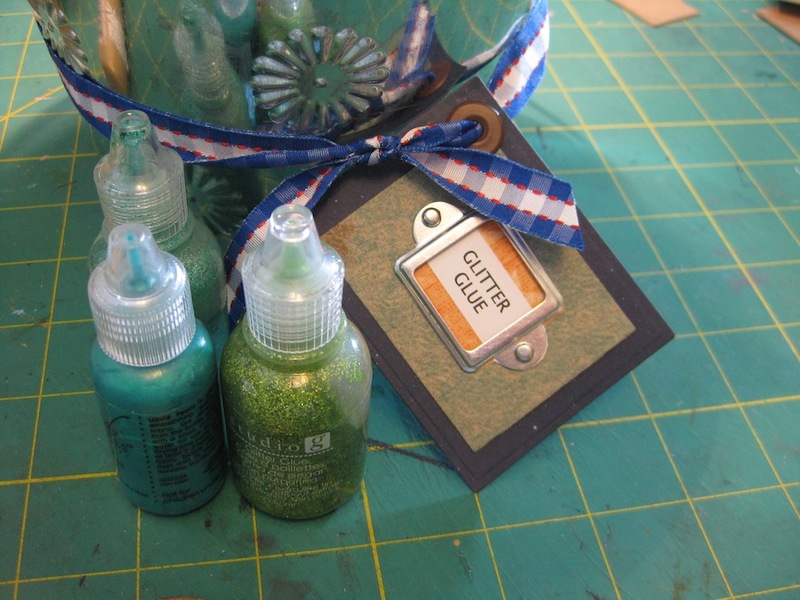 Some glitter, a bit of Distress Stickles, and a Stampin’ Up! 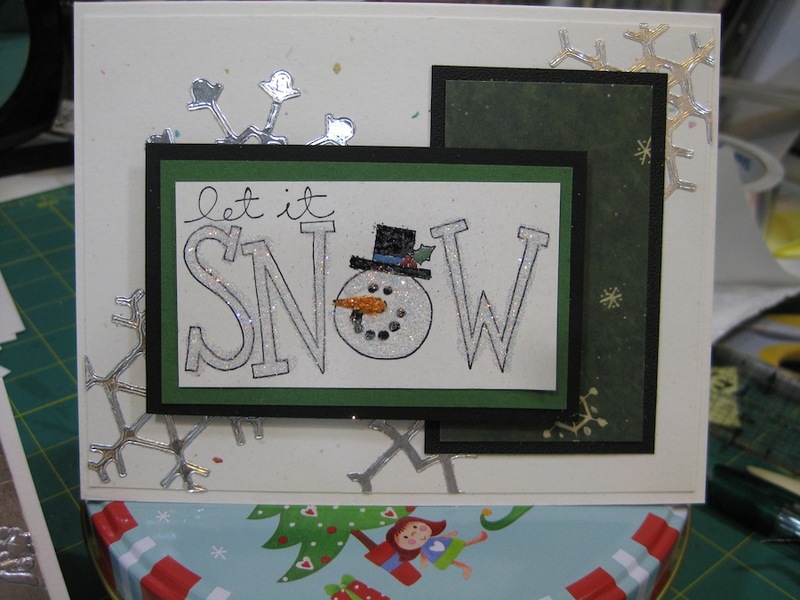 “Let it snow” rubber stamp were the feature items of the card front. I made two sets of cards. One dark and one light. I can’t decided which one I like the best so I sent it out to my Facebook followers to chime in. The consensus has gone to the darker card. 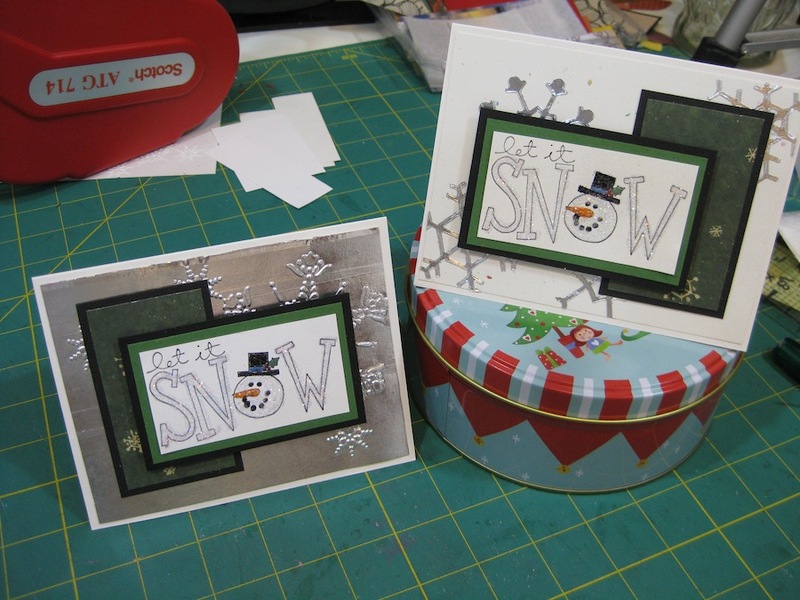 And here is the card with the snowflake die cuts peeking out from behind the snowman. 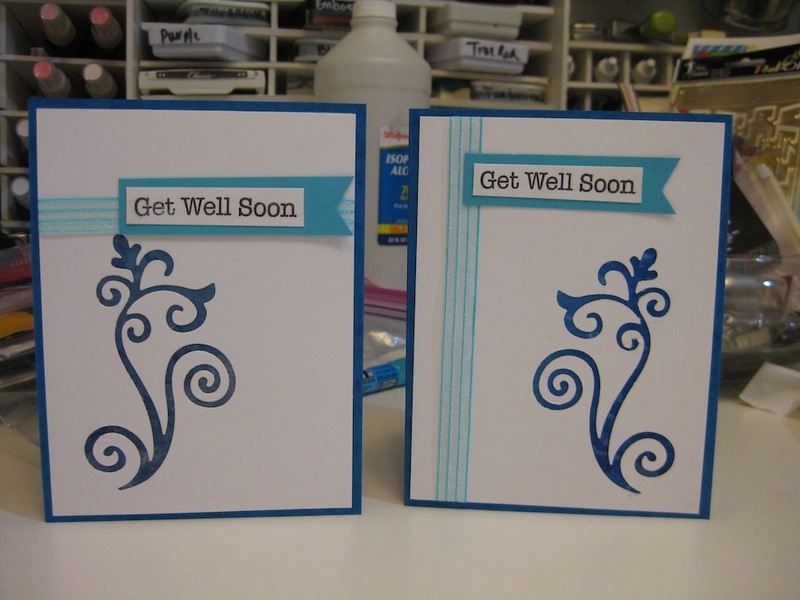 I used Operation Write Home Card Sketch #16 on this project if you want to know how I made it. 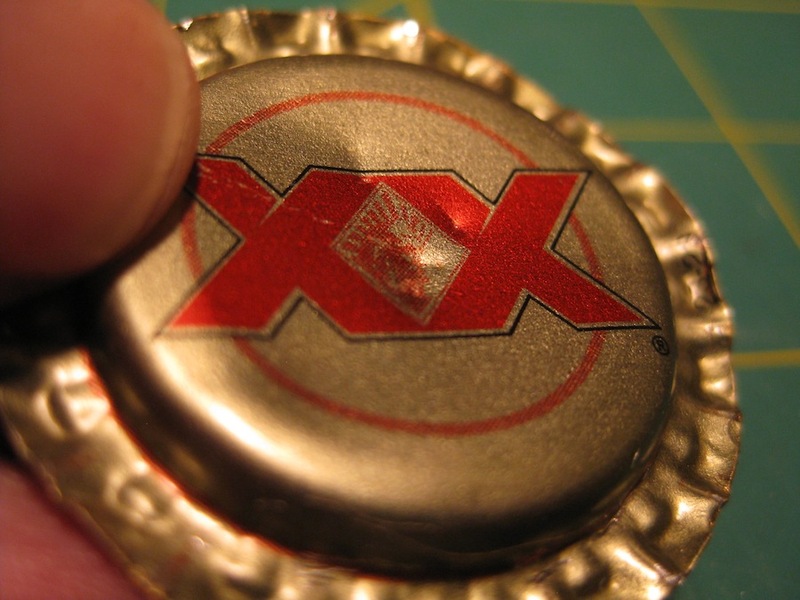 The metal duct tape at the hardware store will make you gulp at the price when you see it. It is almost $20 for a roll of the metal tape. Keep in mind that this tape will last for a long time. 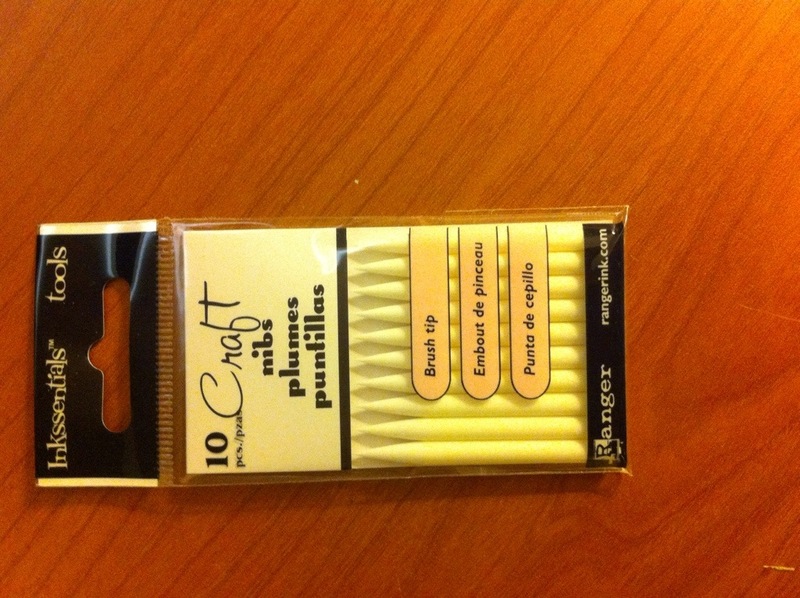 It is not used in everyday crafting projects like other adhesives are. Here is my YouTube video showing the process I used to make these cards with the metal duct tape. I’m in Las Vegas, Nevada….sleeping not gambling. Since May 13th I have been on the road for my day job. My husband, Joe, a friend of ours, Jim, and I have been moving trucks from Tracy, California to Las Vegas, Nevada where they will be sold at auction. 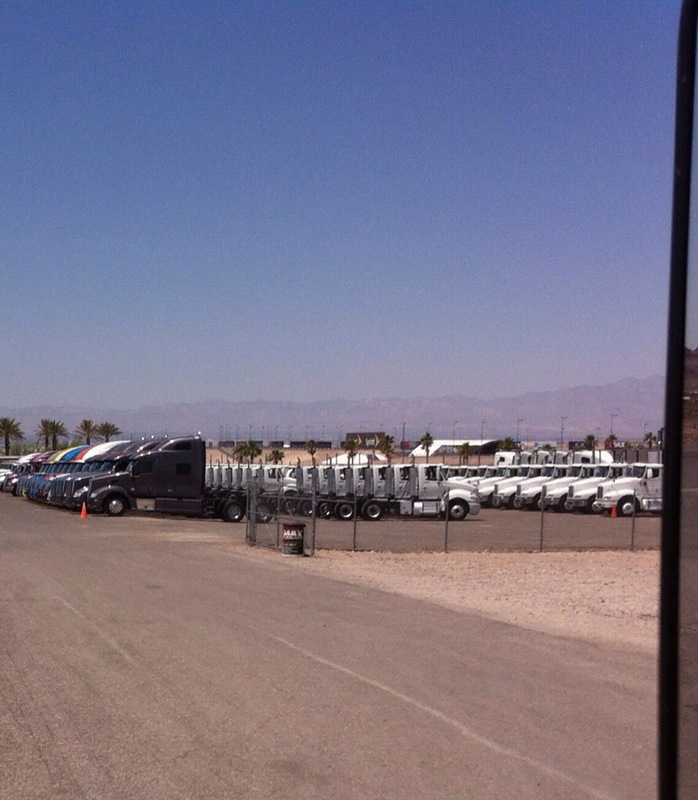 We have moved 45 trucks and six trailers. We took five trucks at a time. I drove one truck and pulled a trailer. We finished the job on Monday. What kept me going all the days of 100 degree temps was the day I would spend in a scrapbook store in Las Vegas. Just before our last trip I read on the store’s website they were closing. Total bummer! Yesterday I walked the aisles, already nearly bare, in search of things I could not live without. I set a budget of $150 – Joe figured I would bust my budget and we would have to rent a U-Haul. I went under budget and spent $112. Paper was one thing I did not purchase. I have a big enough stash of paper already at home that barely gets used. Are you ready for my “Haul”? Here we go. 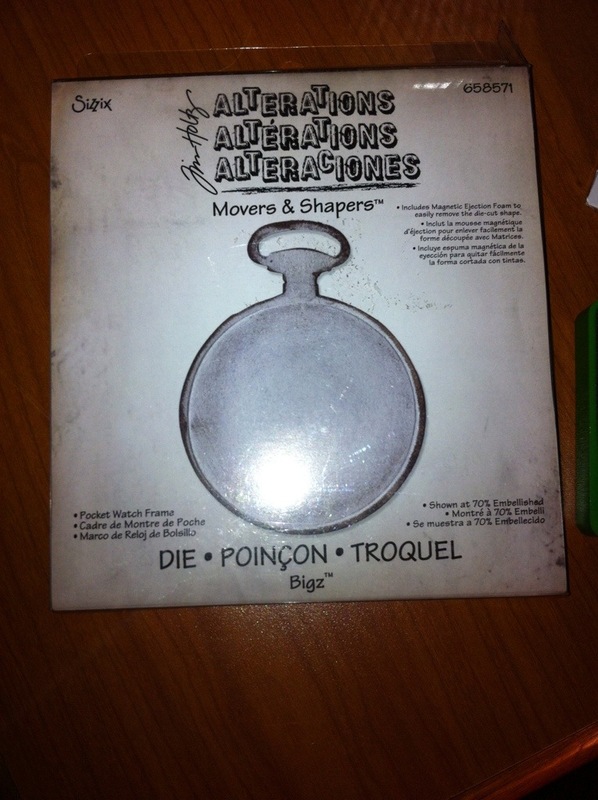 A Tim Holtz die that I have been wanting for a long time. $16.09 – original price $22.99. 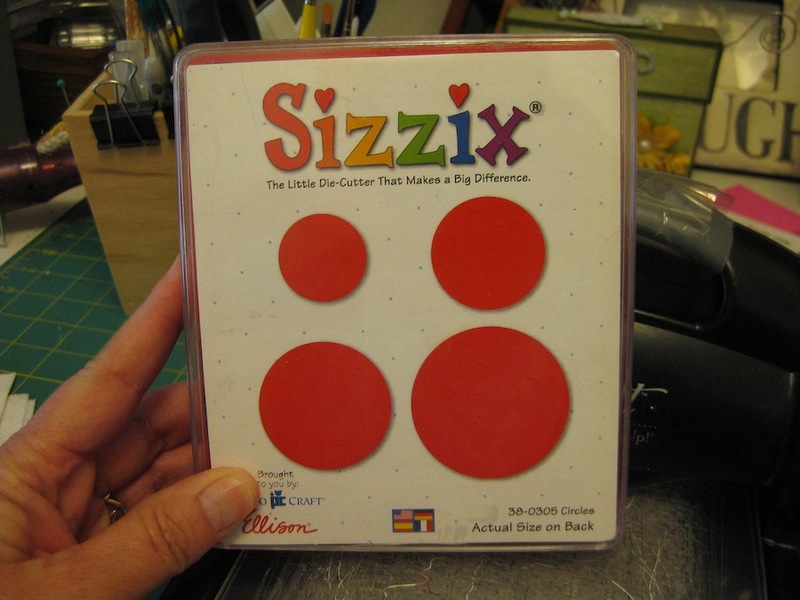 An absolutely cute Sizzix Die (well used) that will be used for creations for my grandchildren. $1. 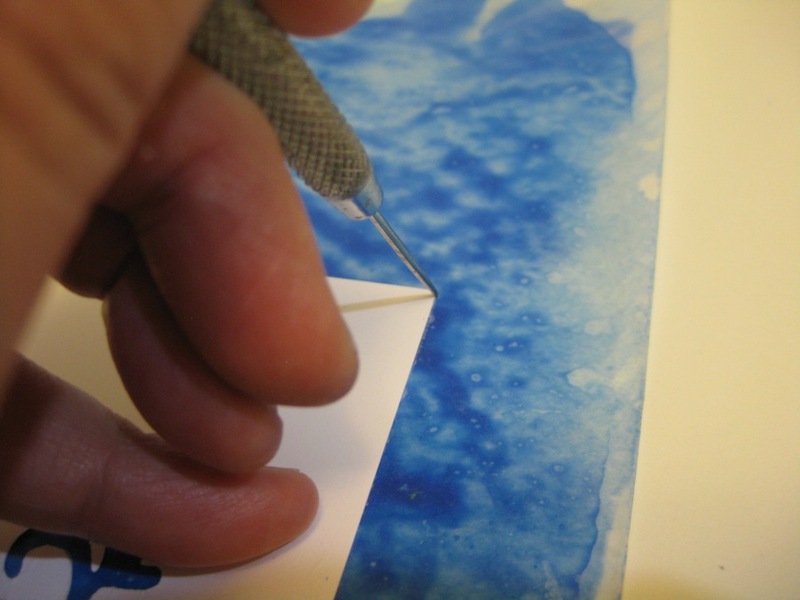 At home, months ago, I went looking for a punch to use with my Zutter or Cinch to add paper pieces to the binding. Couldn’t find one. I did this time and put it in my basket. $11.89 – original price $16.99. I’ve been wanting a heat tool that doesn’t sound like a jet engine in my hands. My heat tool at home is LOUD! 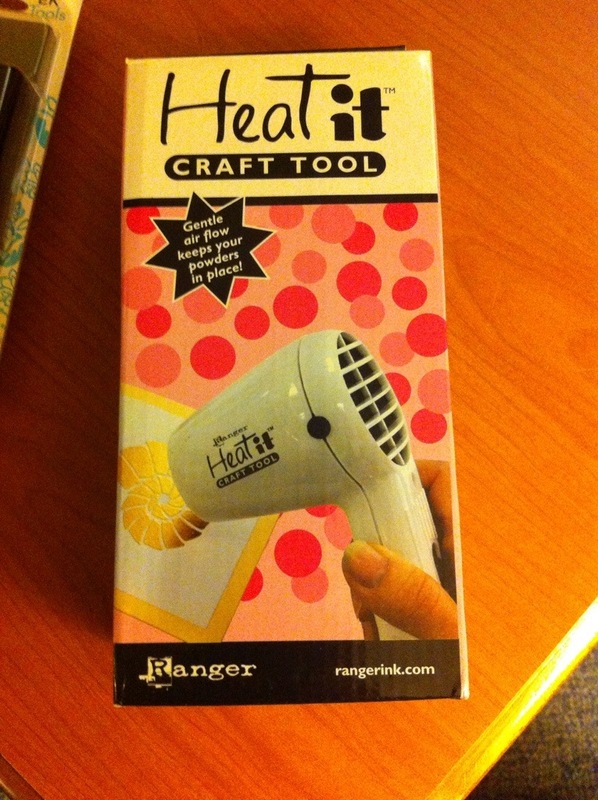 I’ve seen, and heard, the Heat It Tool from Ranger and have wanted one for several years. $18.89 – original price $26.99. Okay, the next items I didn’t even know were on the market. 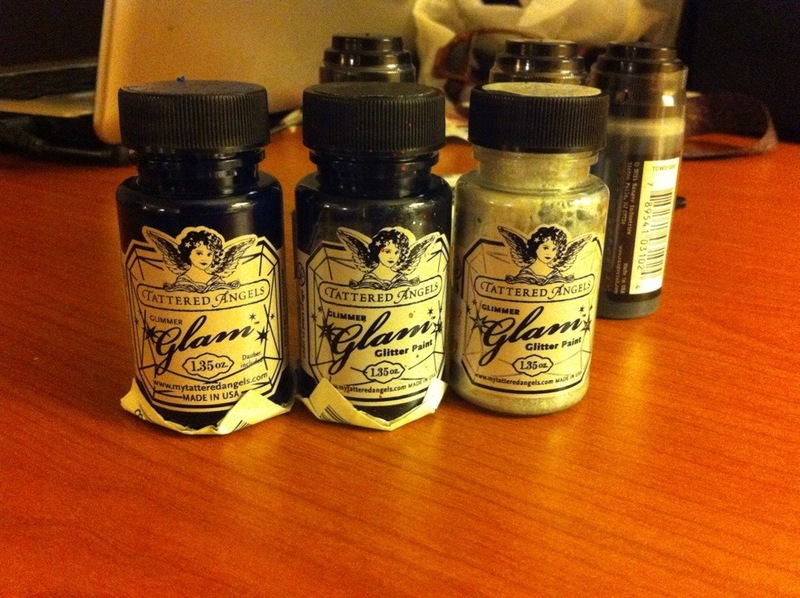 Tattered Angels Glimmer Glam Glitter Paint. I was ruthless. I took three of the five remaining. The other two were duplicates. 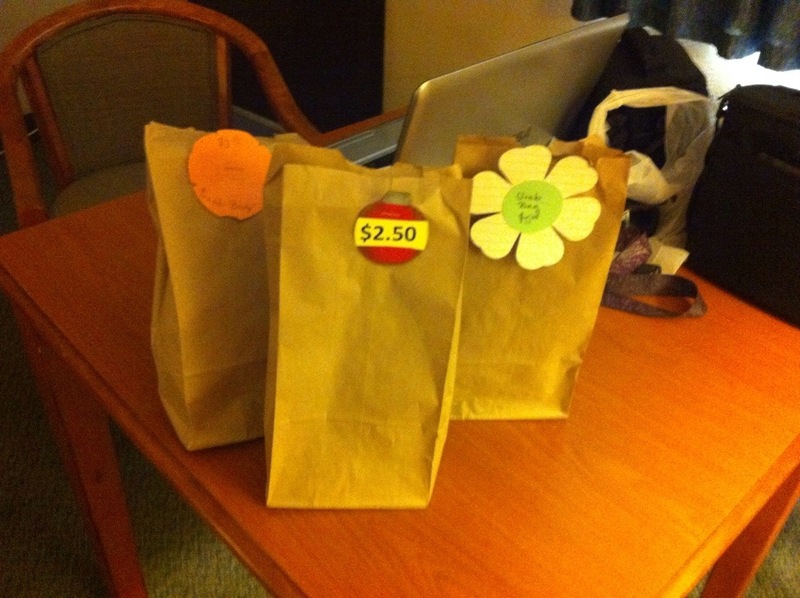 $5.59 each – original price $$7.99 each. 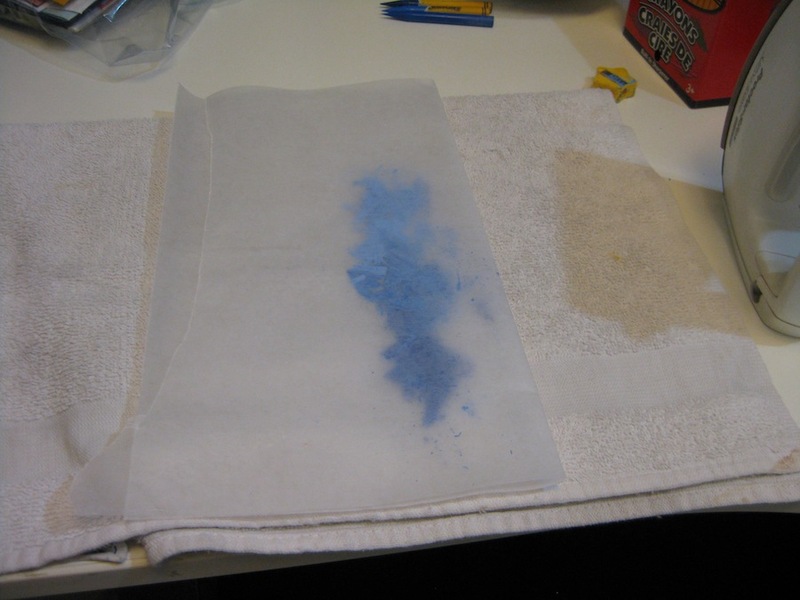 The Ranger Distress Stains had been picked clean. 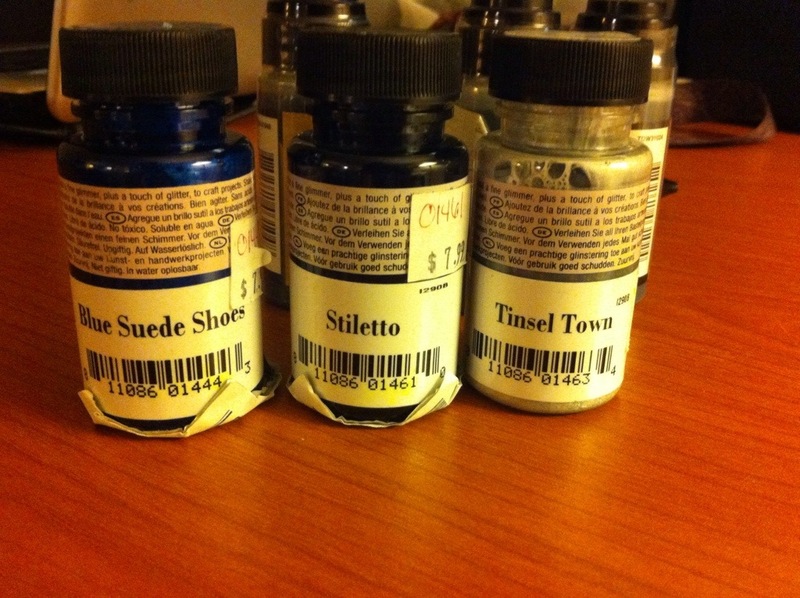 I found three colors I don’t already have. 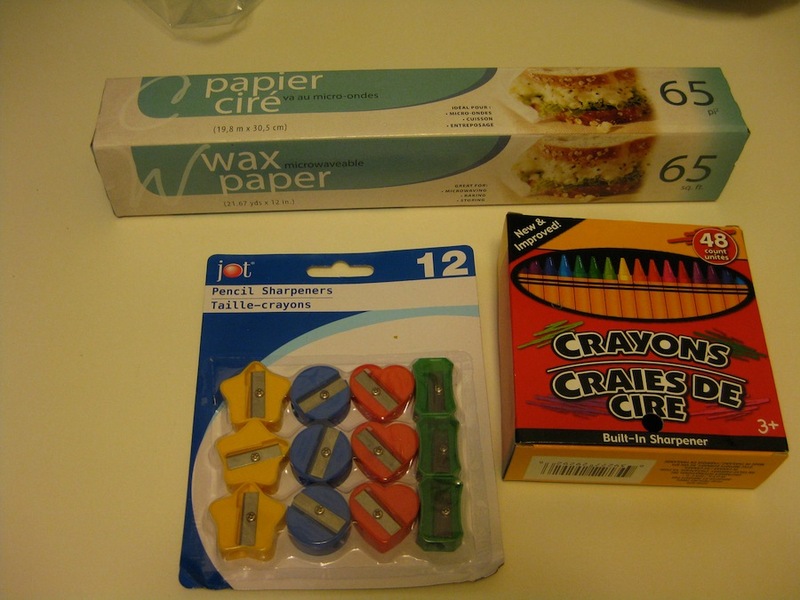 $3.84 each – originally $5.49. I have heard a lot of good things about these next items. 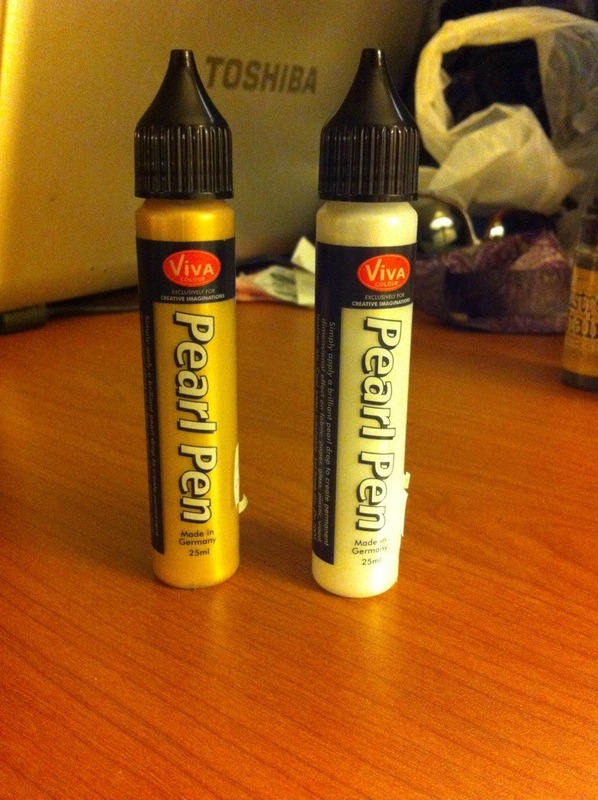 Pearl Pens. Once again, not much left to choose from. I got one “Ice” and one “Gold”. $3.70 each – originally $5.29 each. One of my daughters is getting married next February. 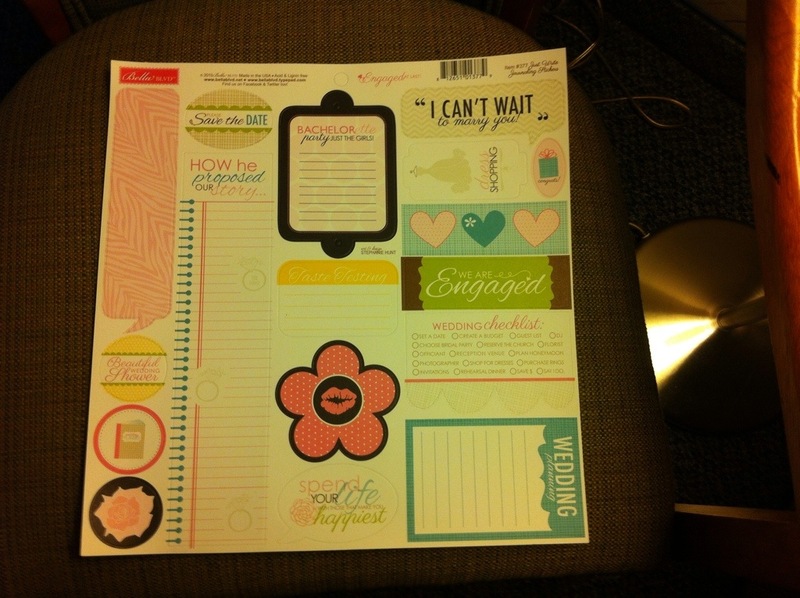 I found a sheet of journaling stickers by Bella Blvd. 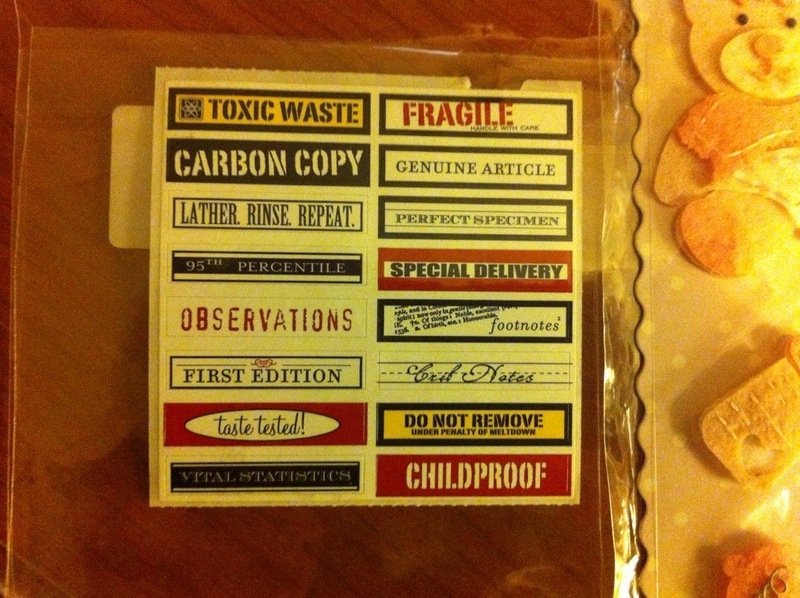 This is the only “paper” I bought. $3.00 – originally $4.29. Of course, no layout would be complete without a bridal dress and cake embellishments. Jolee’s bride $3.70 – original $5.29. 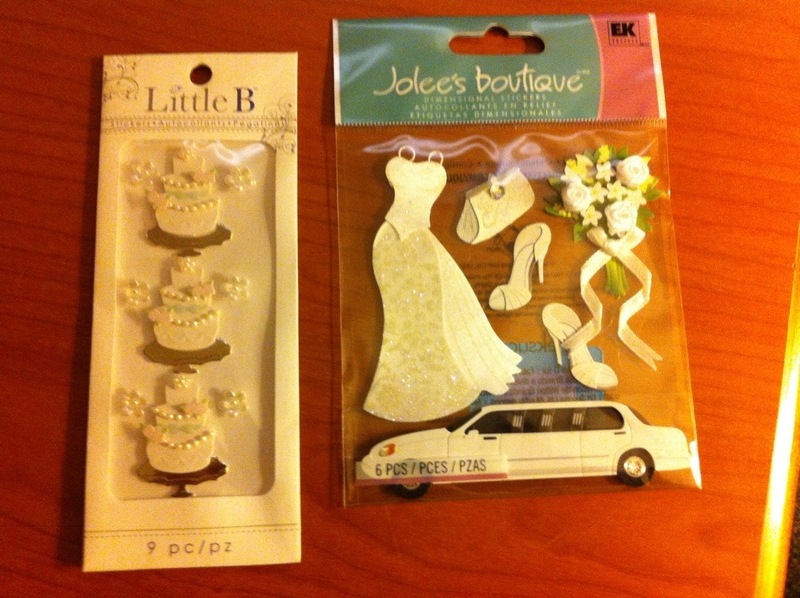 Wedding cake embellishments $3.07 – original $4.39. The Ellison Die Cutting machine was out of my price range at $325. 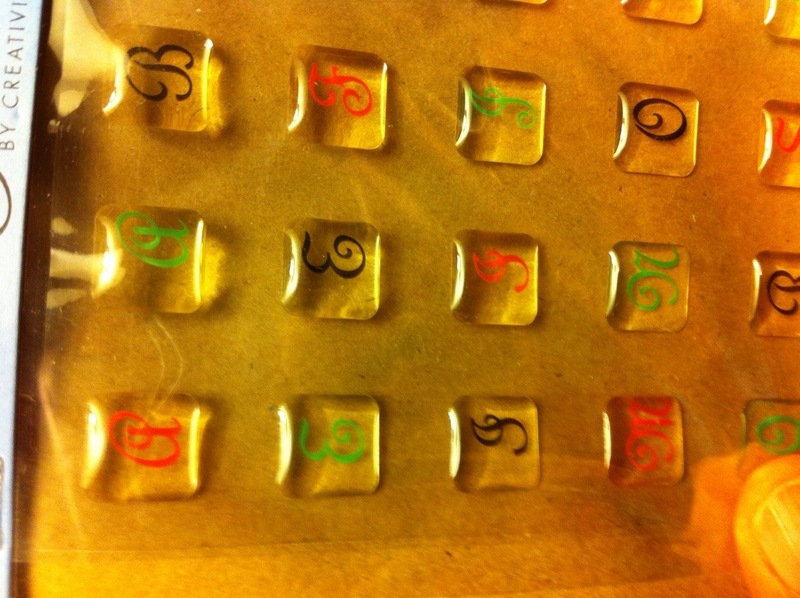 The dies were priced according to size and started at $100 for the giant dies then $50 to $15 for the smaller sizes. 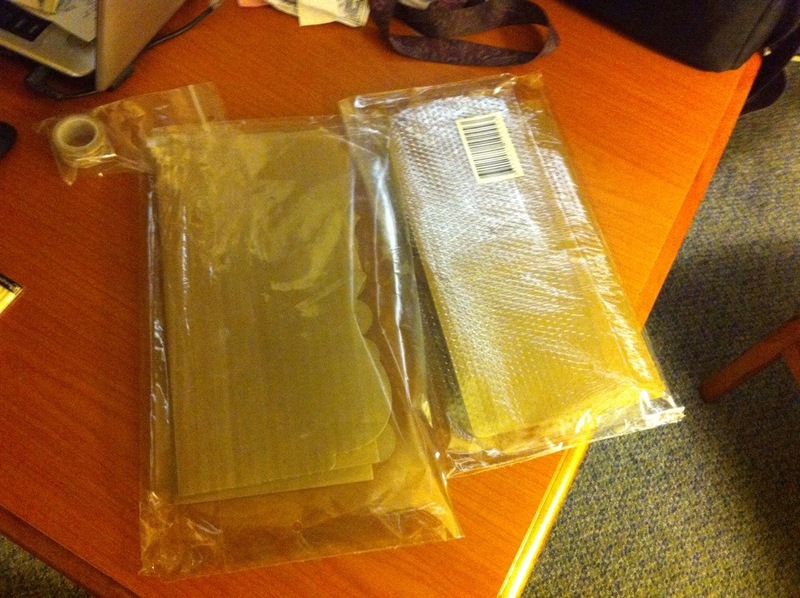 I settled for some cardboard mini album cutouts at $1.60 each and I bought two of them. 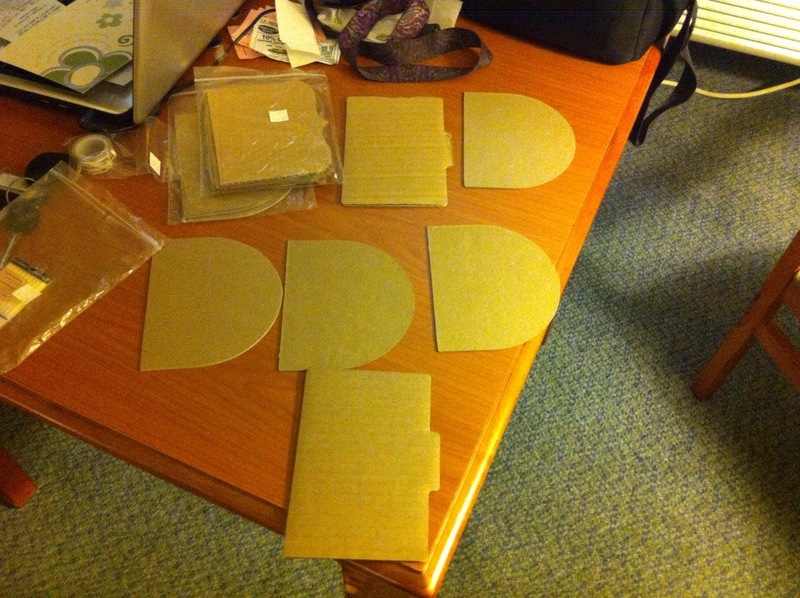 I also found three chipboard mini album bases at $1.20 each. 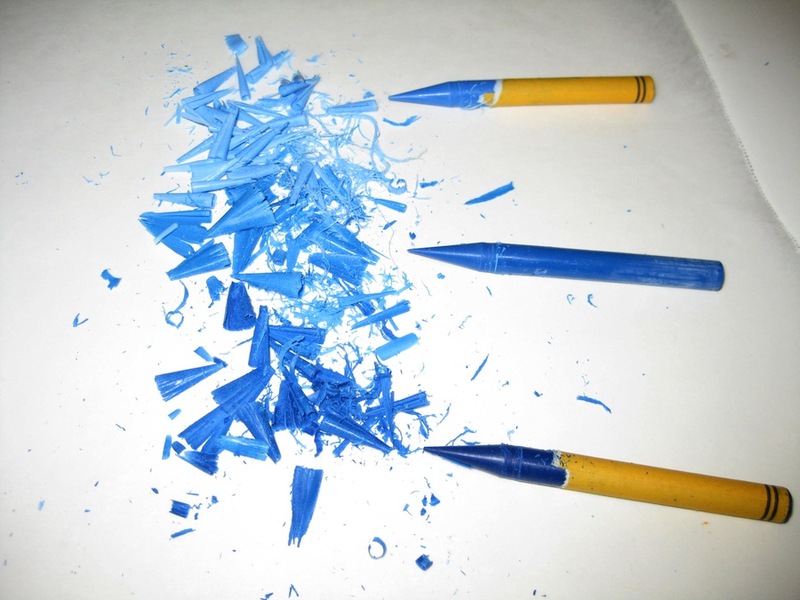 These nibs from Ranger I’ve never seen before. 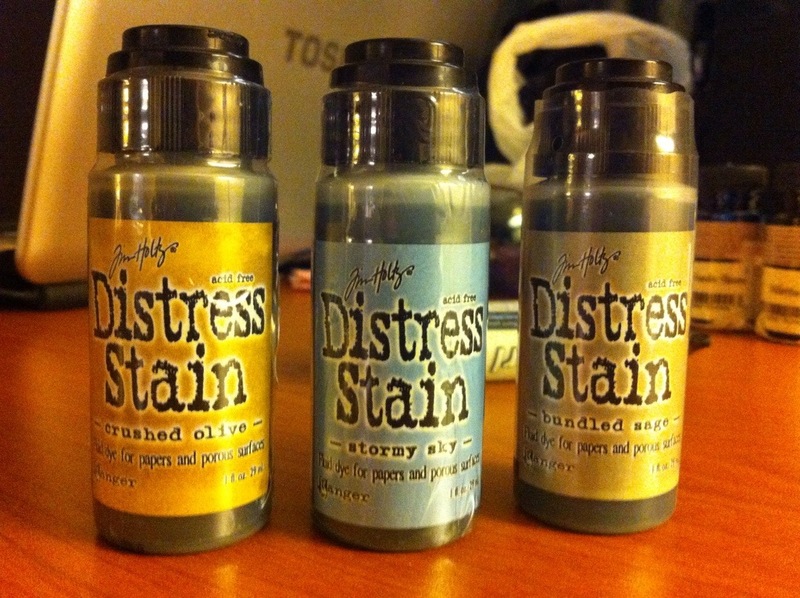 Probably because I don’t own a single Distress Marker. I thought I could use them with the Tattered Angles Glimmer Glam stuff. $3.84 – original $5.49. 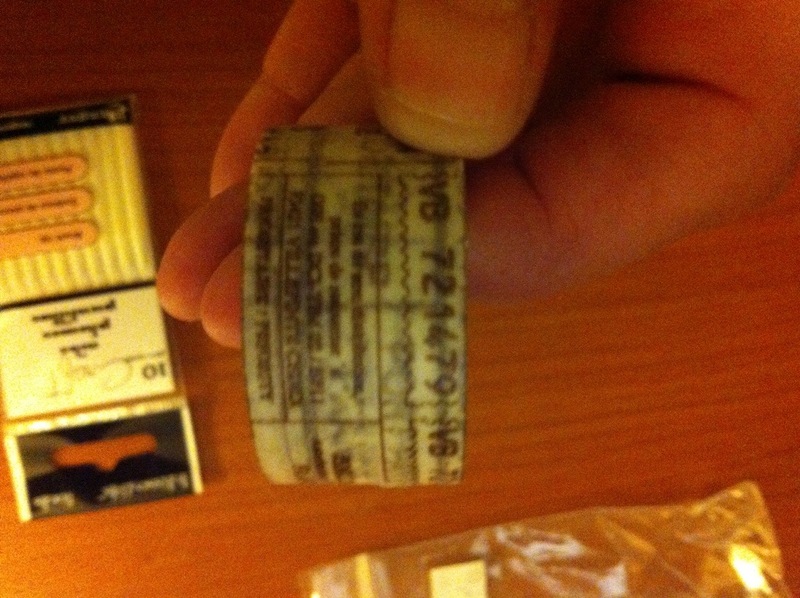 A small roll of Washi Tape to add to my small collection. This was the only roll of Washi Tape in the entire store. $2. In a large tub, stuffed under a piece of furniture was a stash of Grab Bags. What the heck. Might as well get three of them. I might be surprised. And I was. 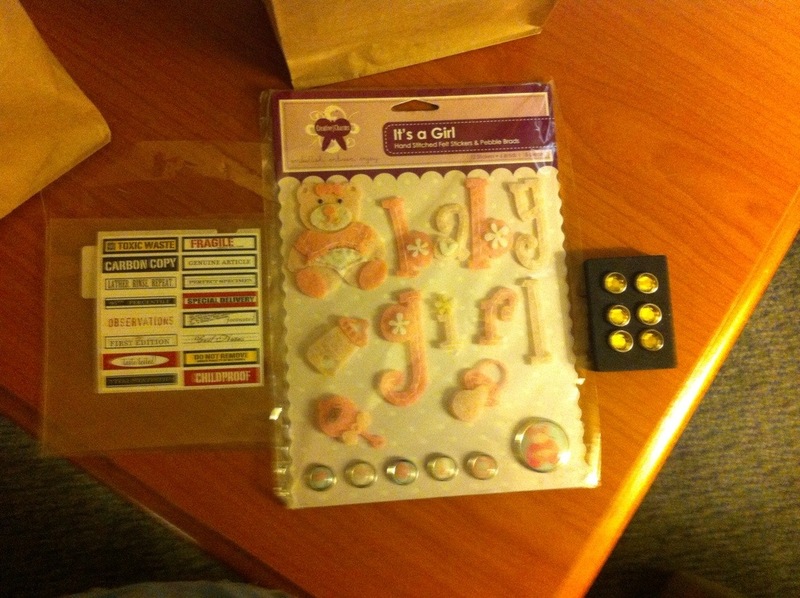 Baby themed items were in two of the bags. Woo Hoo! I have a daughter just about to deliver twins in the next few weeks. Two Grab Bags at $2.50 each. 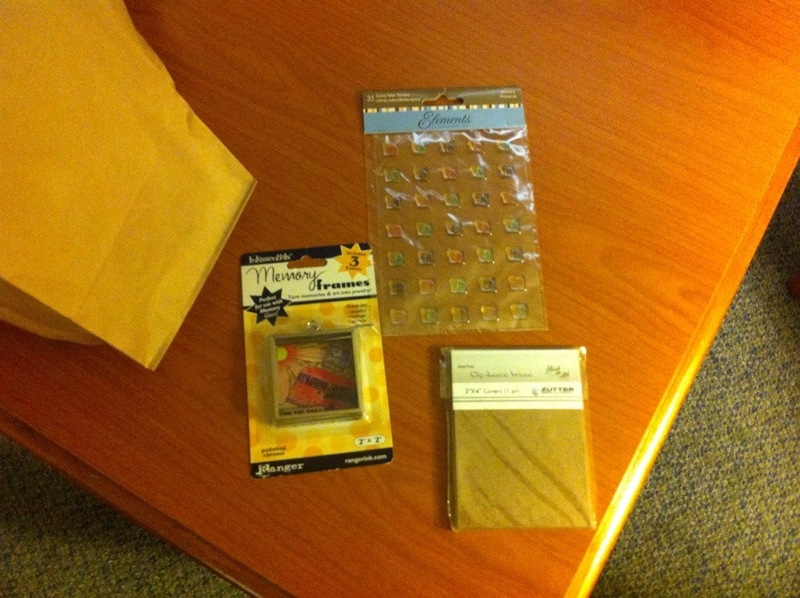 The last item in my Haul is a $5.00 Grab Bag. 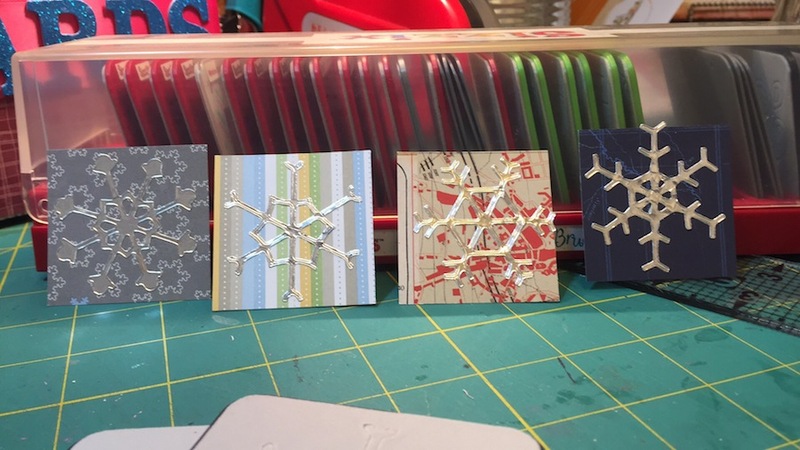 Clear epoxy letter squares, Ranger square pendents, and some Bind-It-All mini book covers. Bonus items for the new family! So, there you have it. My haul from Las Vegas. I still won’t be home to play with this stuff for another couple weeks. Boo Hoo :/. 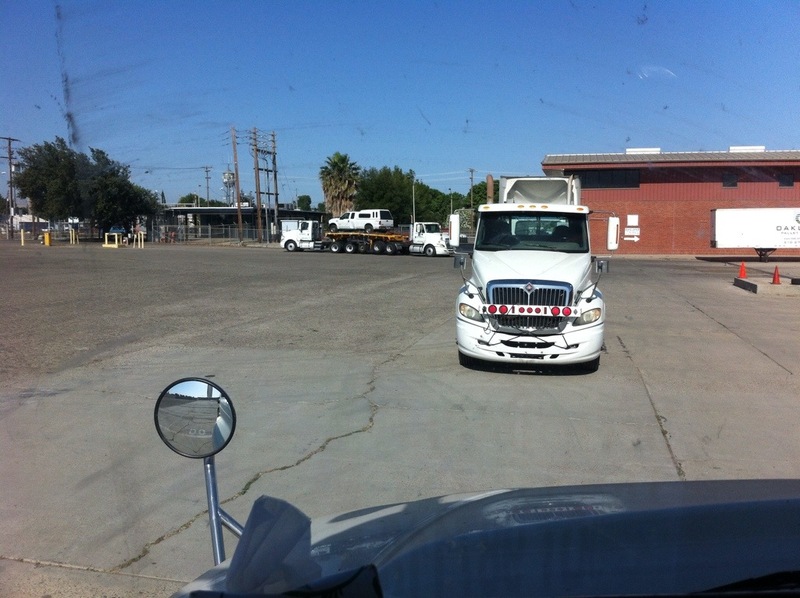 We are slated to take three trucks out of Fontana, California going to Grand Island, Nebraska. We will get home before the end of this month – I HOPE! Hope you are enjoying your bright summer Wednesday. by Message In A Fold in Cheap Tricks Tags: beads, Big Shot, birch plywood, corsage pins, Notes & Details stamp set, Plane & Simple stamp set, sizzix dies, Stampin' Up! 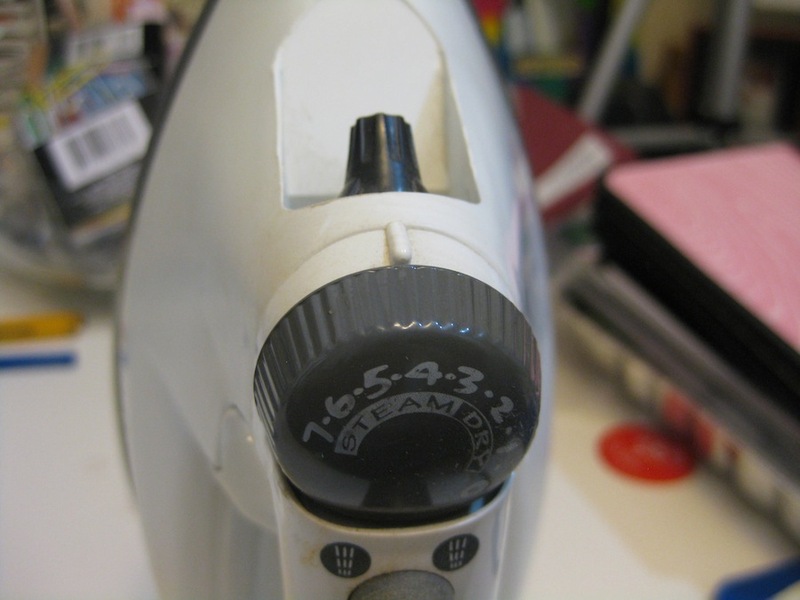 I’ve heard the Sizzix dies and machines can cut through many things that are fairly thin. I’ve had an idea floating around in my head for quite a while but had been a bit hesitant to try it. Especially if I damaged my Big Shot in the process. Who wants to take the chance of damaging a very expensive tool? Not me. My most recent trip to Michaels got the better of me. 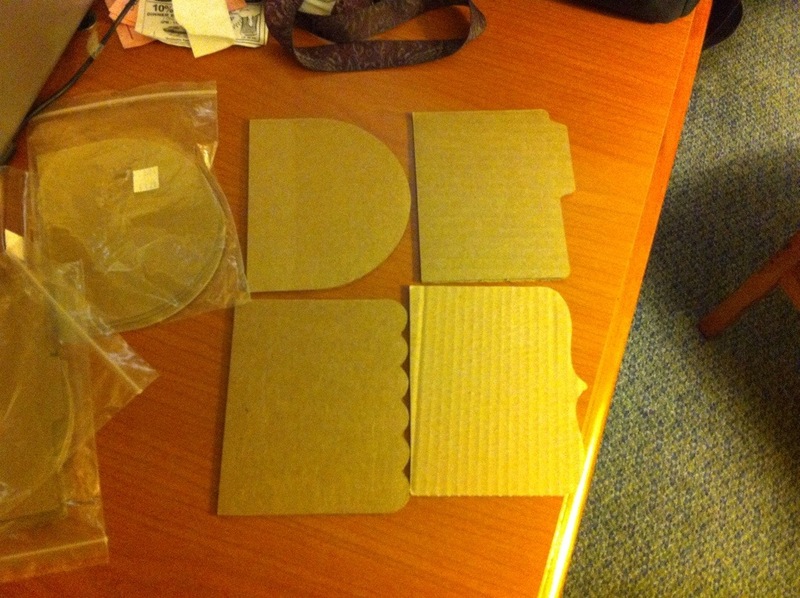 I purchased some 1/32 x 6 x 12 Birch Plywood. 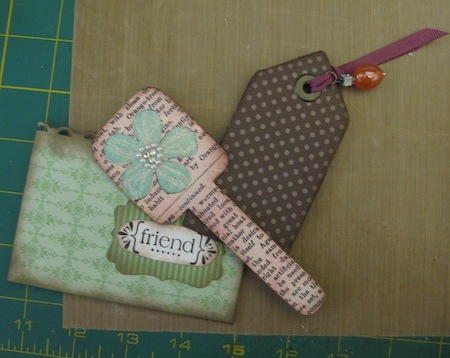 My practicing was done with an old tag die from Sizzix and some garden stakes purchased in a package of six. 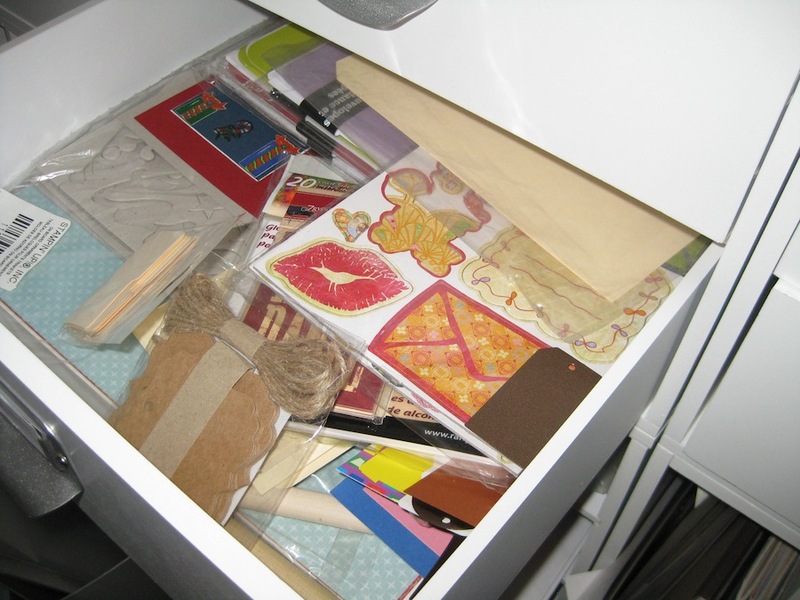 I would caution using the wood inside your scrapbook or mini albums. Wood, with the natural lignin present, will eventually damage your photos by turning them yellow and causing them to crack and fade. If you think you want to try this technique then use the wood embellishments on the outside of your albums. 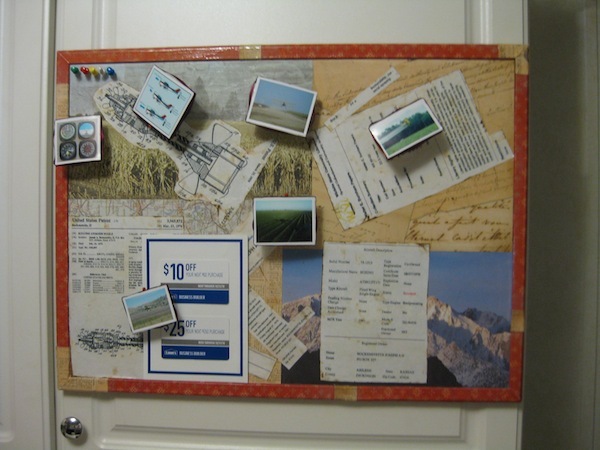 For Joe’s birthday last year I made him a bulletin board. 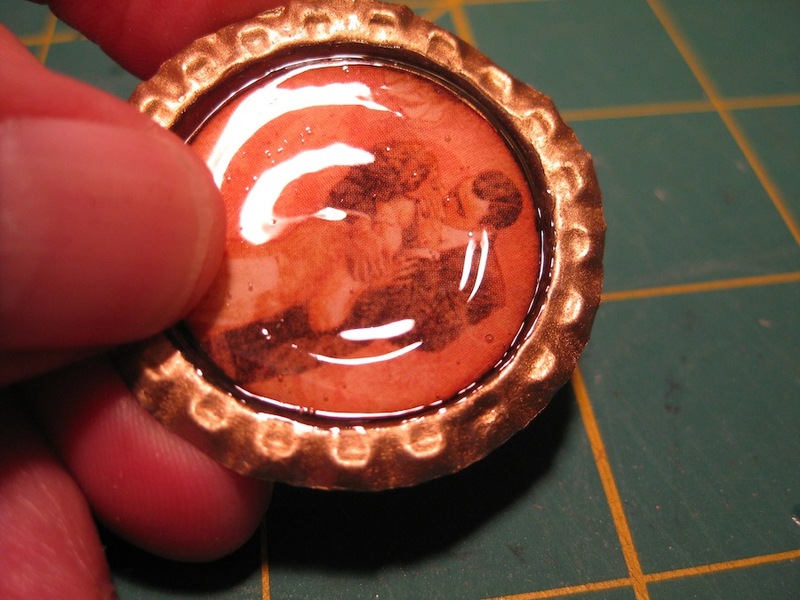 I’m not totally thrilled with it because the cork part is so very thin. Still, I wanted to create a very personal piece of his “former” life when he was a Crop Duster. During the many years he did low level flying and spraying fields he felt the spray nozzle needed a bit of tweeking. Spray more uniform drops of the chemicals being applied to the crops. He holds a Patent for the Uni-Mizer Spray Nozzle that he designed and built. On the left side of the bulletin board are items I found on the internet and printed off. His mechanical drawings of the Uni-Mizer (top and bottom left) along with the technical specifications detailed in the publication located middle left. He is also mentioned in various other places on the internet during his flying years – they are on the right. The airplanes he has owned and there are documents held in a museum in Kansas that pertain to a prominent (at the time) person that was the authority on all things related to crop dusting. The small photos are not of Joe’s flying but images I found on the internet that would remind him of his many years as a crop duster and a business owner. I’m in the process of creating a book for his current life as a truck driver that will hold the information he requires for our Day Job. 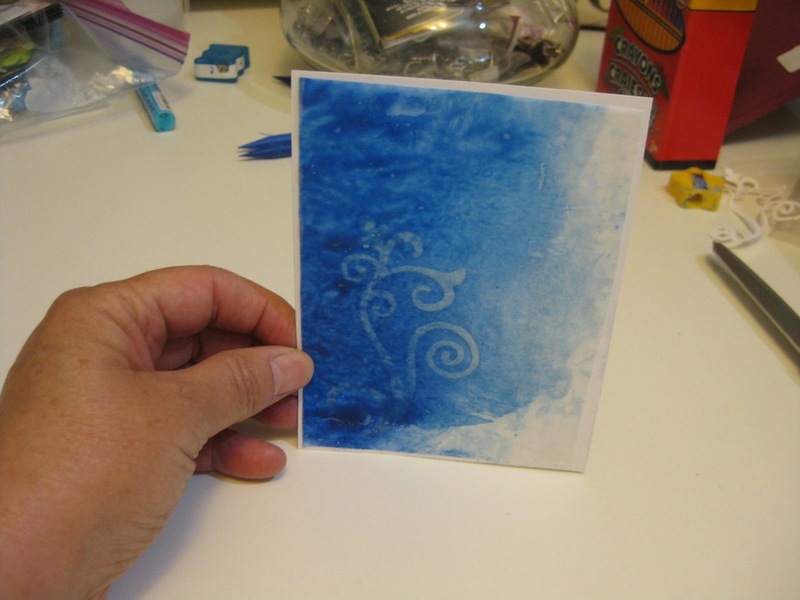 I’ve used the Stampin’ Up! Top Note die to cut out the birch plywood. 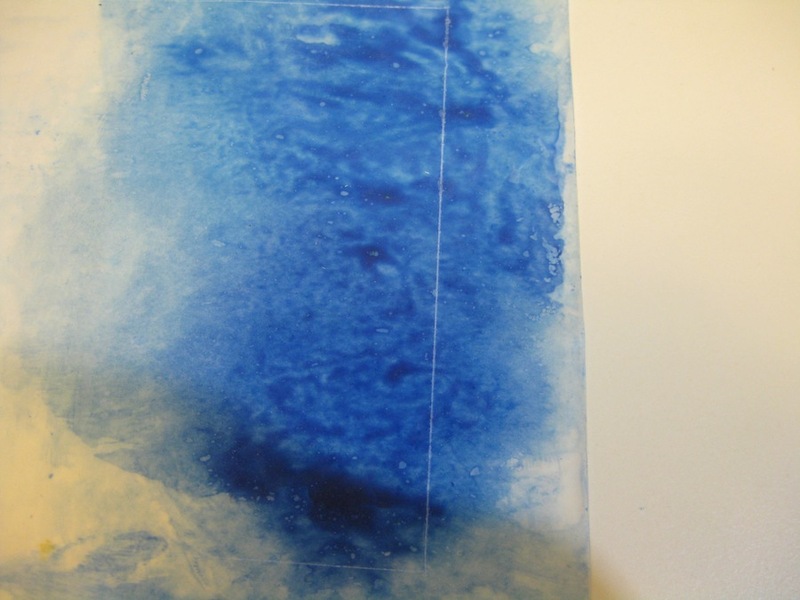 I’ve used my “brews” of Not Quite Navy, Cajun Craze, and Always Artichoke to color the background and kind of make it look like the sky and ground. 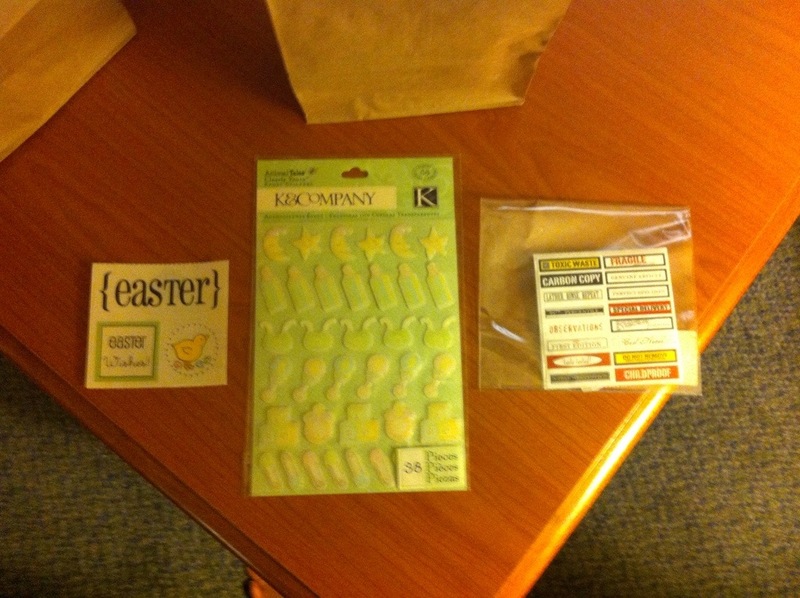 The stamp set is Plane & Simple from Stampin’ Up!. 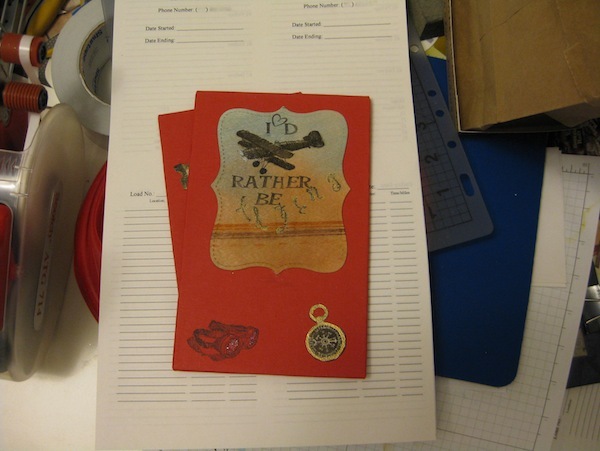 The letter stamps are from my stash and say “I’d rather be flying”. I had to use a heart stamp for the apostrophe in “I’d” since my sets didn’t include a comma or apostrophe. Basic Black Classic ink was used for all the images stamped – the airplane, goggles, and the compass – all from the Plane & Simple set. 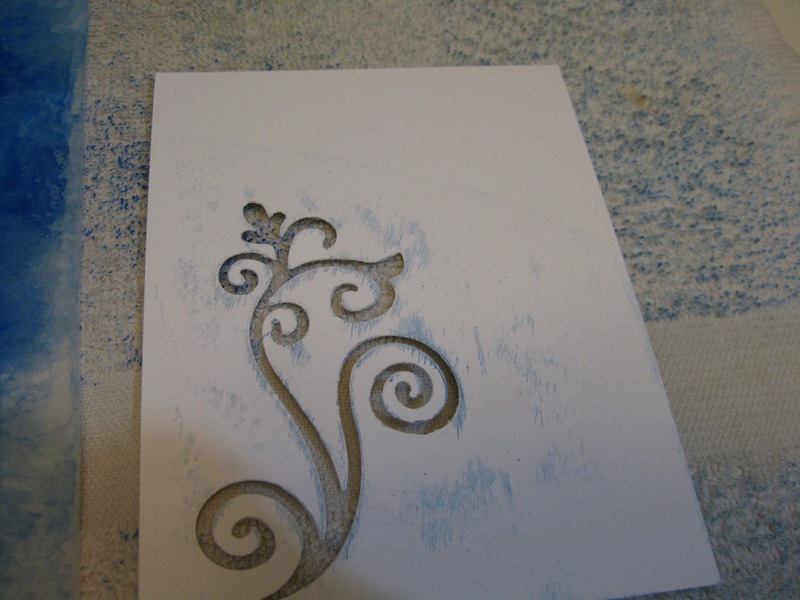 I’ve used both Clear Embossing Powder (SU) and gold embossing powder from my stash. The gold is around the compass and the clear is on the goggle lenses and the airplane. 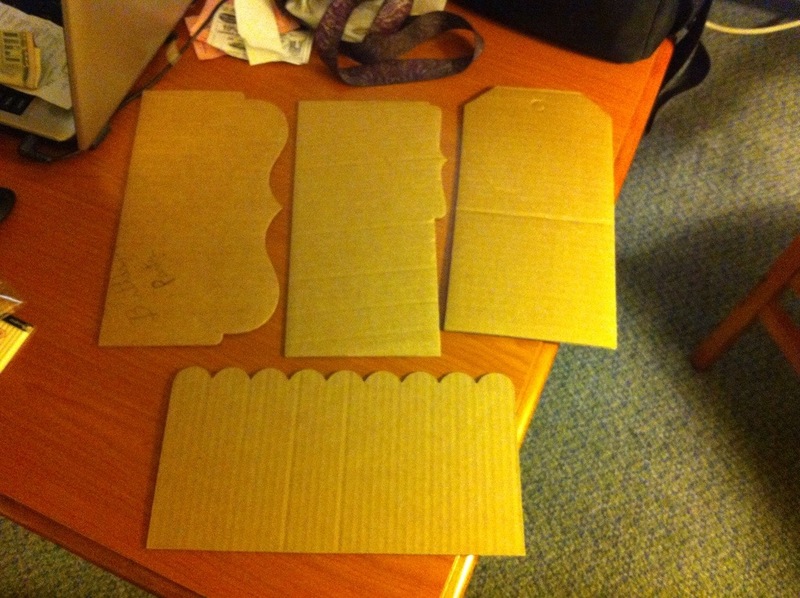 I’m also making him a note pad that will fit in his shirt pocked. 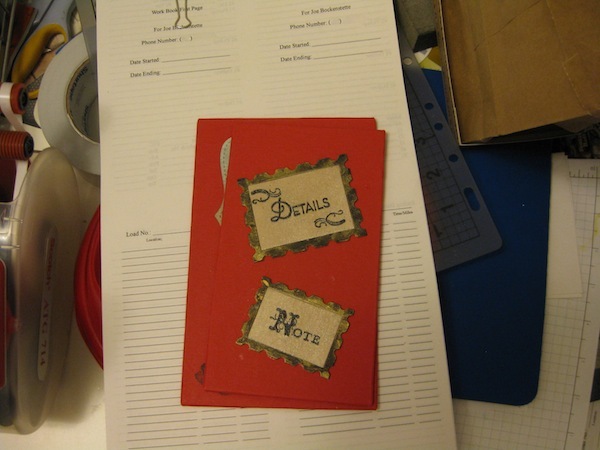 Both the note pad and the mileage book will be bound with my Bind-It-All when they are ready for assembly. 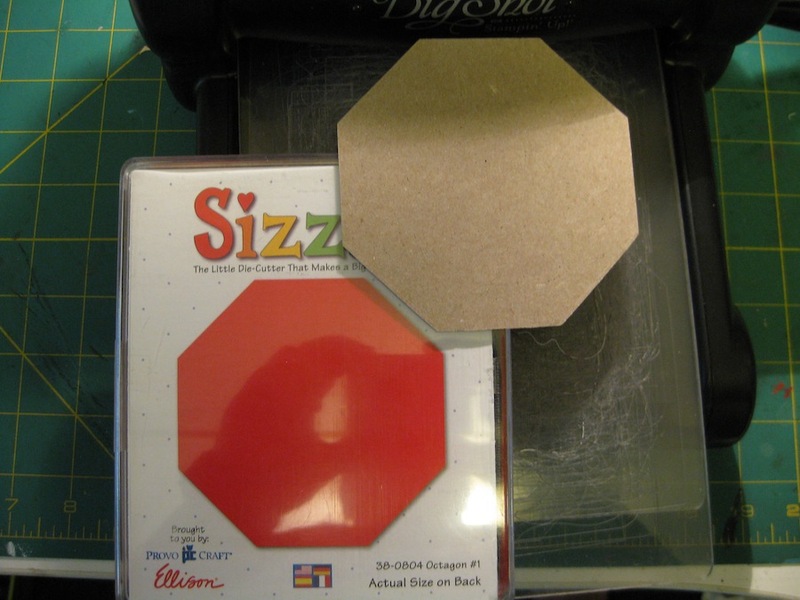 Once again, I’ve used an old Sizzix die. This one is a frame set that resembles a postage stamp on the frame. 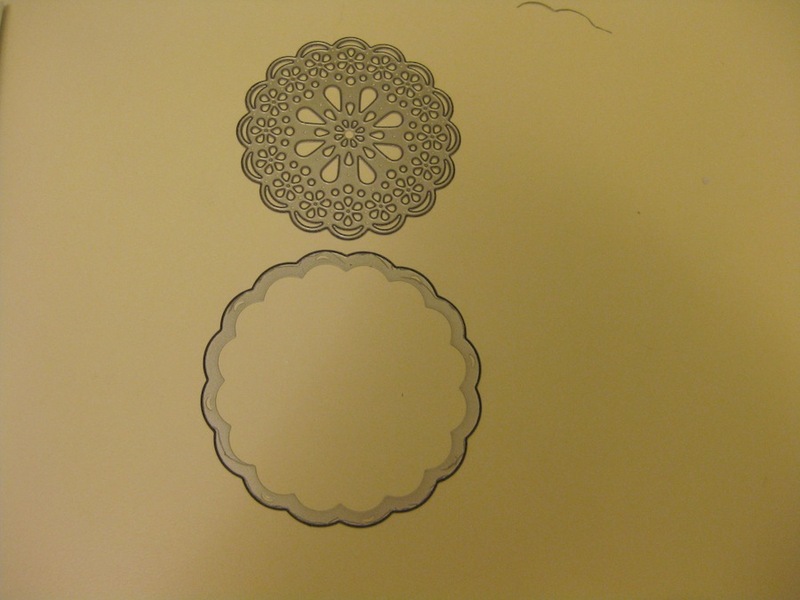 I’ve covered the frame part with Basic Black card stock from Stampin’ Up! and then did a dry brush (using my fingers) technique with gold acrylic paint to make the black not quite so sharp. 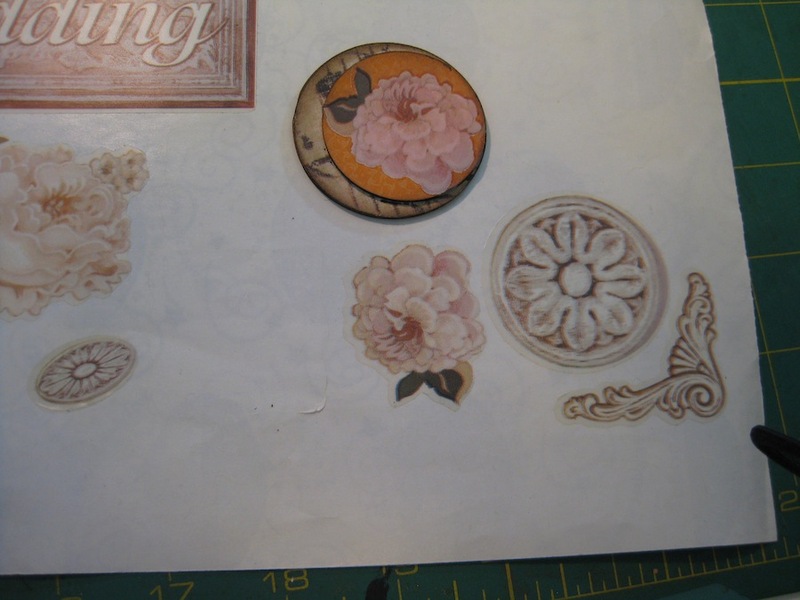 I’ve used the Notes & Details stamp set from Stampin’ Up! 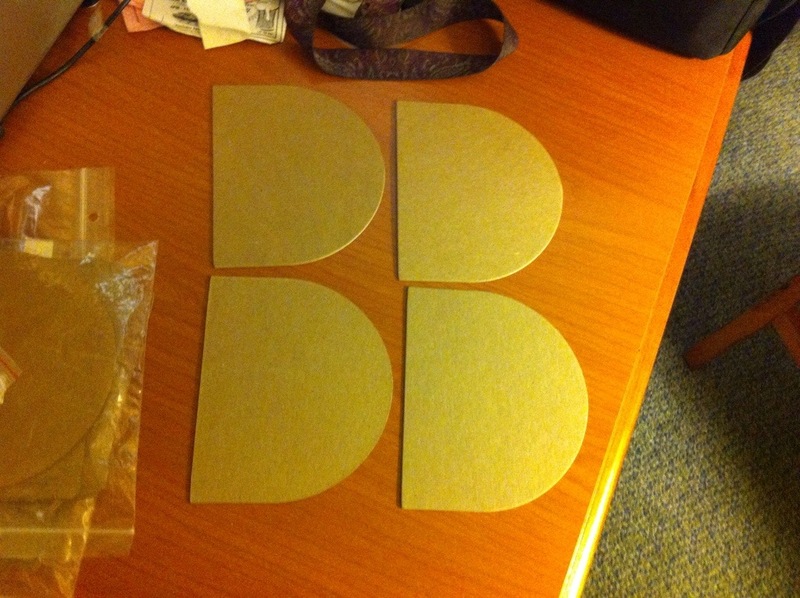 on these two pieces cut from the birch plywood also. 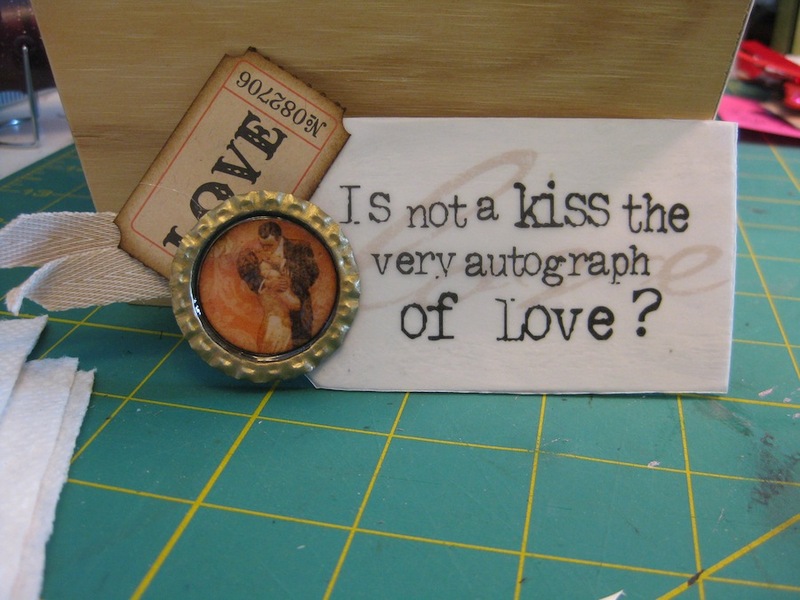 I’ve left the inner part of the frame sets unaltered except to add some Champagne Mist Shimmer Paint from Stampin’ Up! to give the wood a bit of a glow. 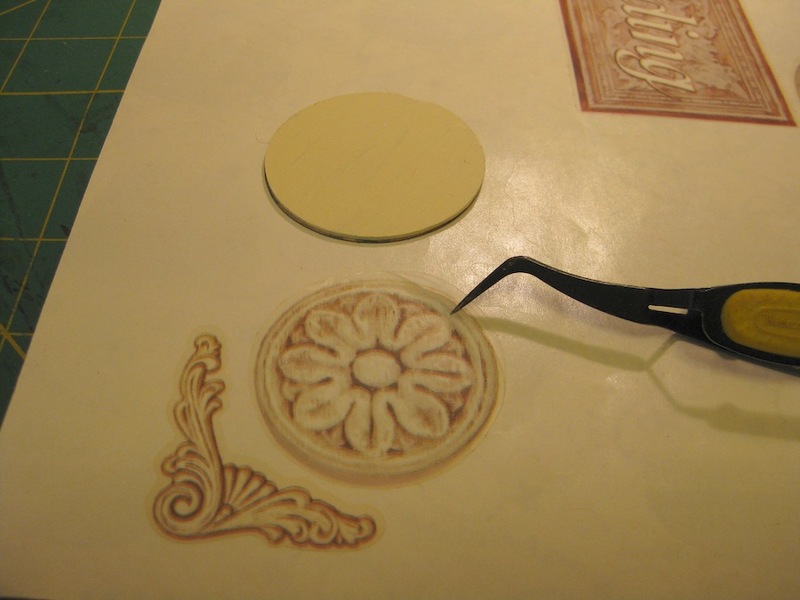 I’ve also used black embossing powder – from my stash – on the words and small flourish stamps. One note of caution. 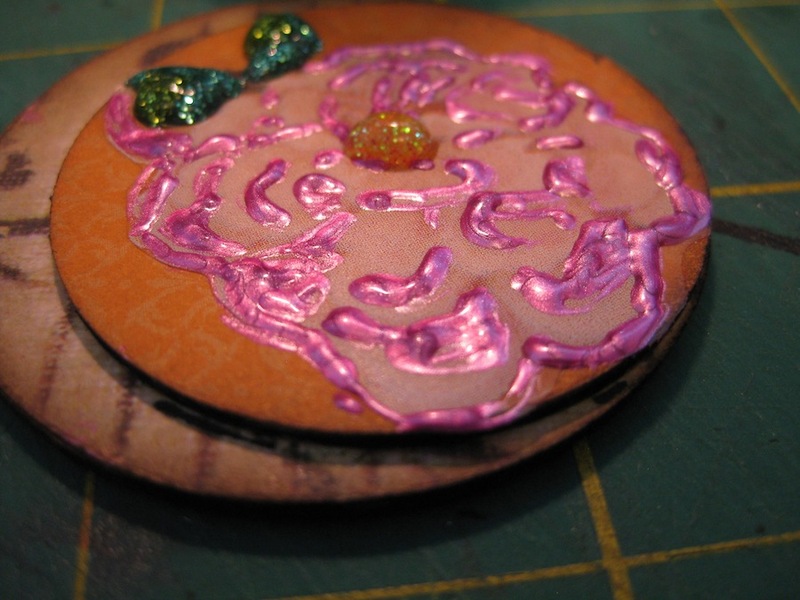 When using heat embossing on the wood with black embossing powder, be extra careful with the heat tool. 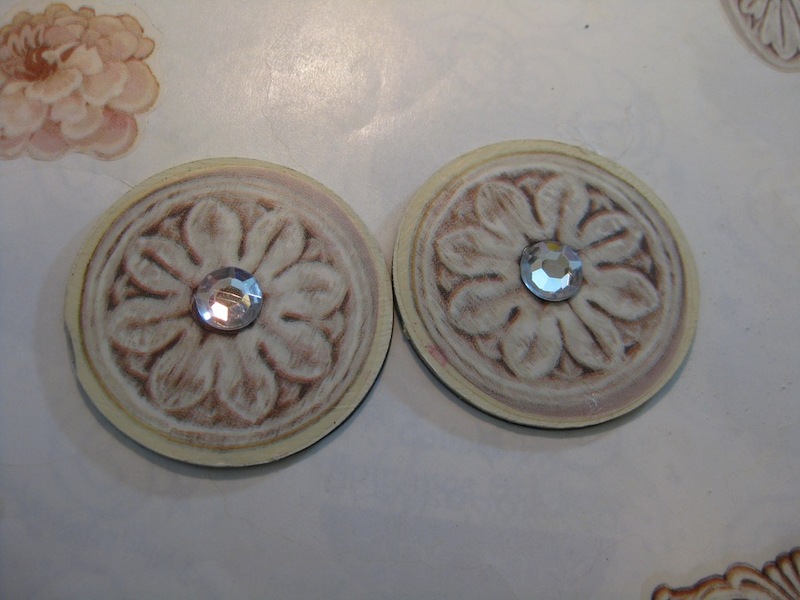 The longer you leave the heat on the more the embossing powder has a tendency to migrate through the wood grain and cause it to bleed and distort. The next part of the assembly of these two books is to cover the wood with some Triple Thick Gloss stuff to protect the work I’ve done on these two. I’m only going to put that thick stuff on the wood and not on the entire cover. Over my years of paper crafting I’ve picked up beads and charms. Since I’m not into jewelry I don’t know why I’ve even bought them but I have. Seeing all those beautiful pins being made lately I thought I’d give it a try. Can you say “Woof Woof”? Not on purpose, but by total accident I’ve created a poodle and a wiener dog. 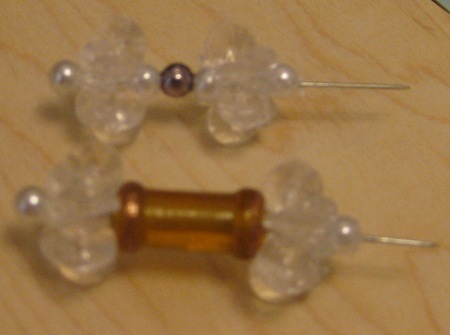 I have a bunch of star bead things and decided to use them on the corsage pins along with some beads. This is the result of my going where I’m not comfortable. 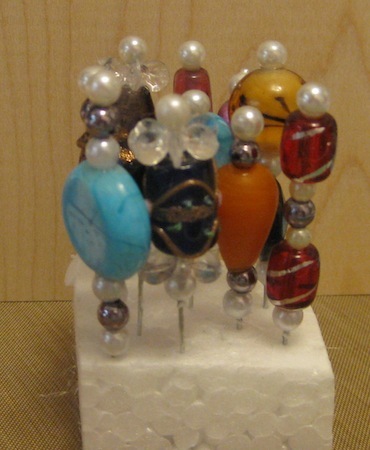 How far down the pin do you go when adding the beads? I’ve got a few where there is barely any pin left. That required a bit of research. I spent a little over an hour on YouTube finding enough videos showing how to create the pins. I think maybe I should leave this up to others. 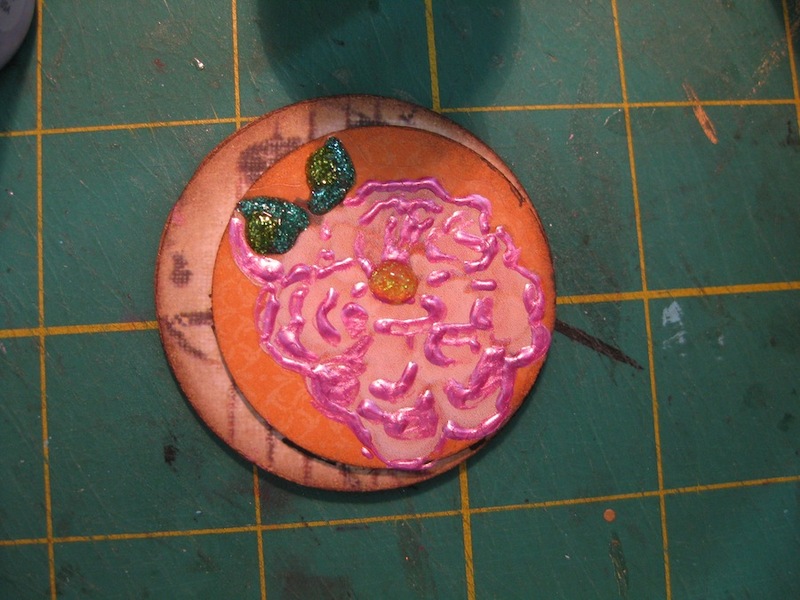 Although, after many hours of chasing beads across my work surface, scrabbling on hands and knees after the “escapees” and drawing blood from all the pin sticks I did come up with several that I thought looked fairly good. 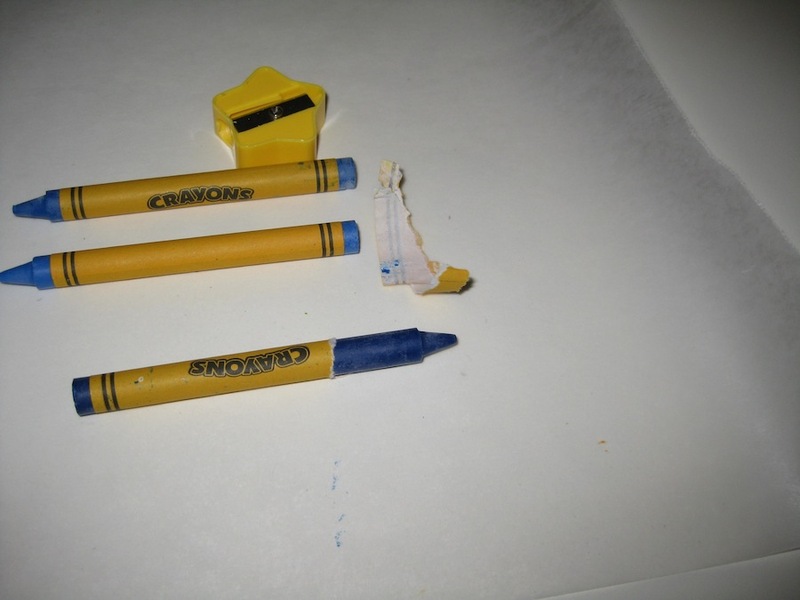 At least no more dogs were in evidence. I still am having a bit of difficulty in knowing when to stop and when enough is enough. I don’t think this is where my philosophy of “If one is good then five would be better” applies.